66121 top and 66019 tailing on 3J41 Didcot to Didcot RHTT via Westbury. 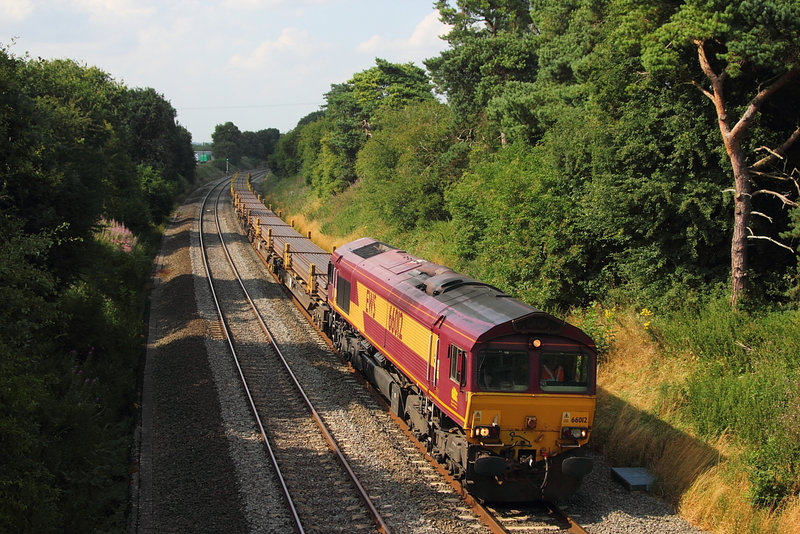 ​ 66066"Geoff Spencer" 6C58 Oxford Banbury Road to Whatley empties. 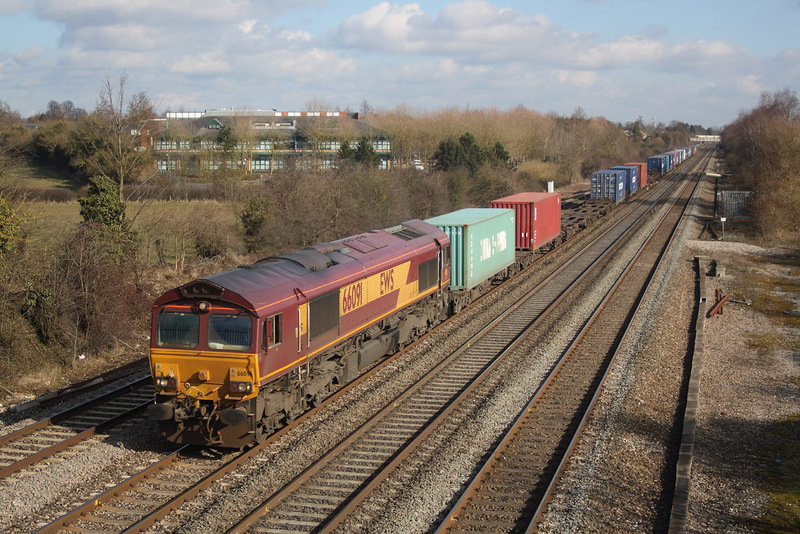 66154 6O30 Castle Bromwich to Southampton docks loaded Range Rovers. 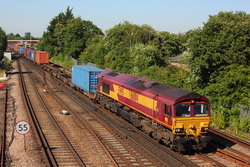 66105 4O43 Wakefield Europort to Southampton inter-model. 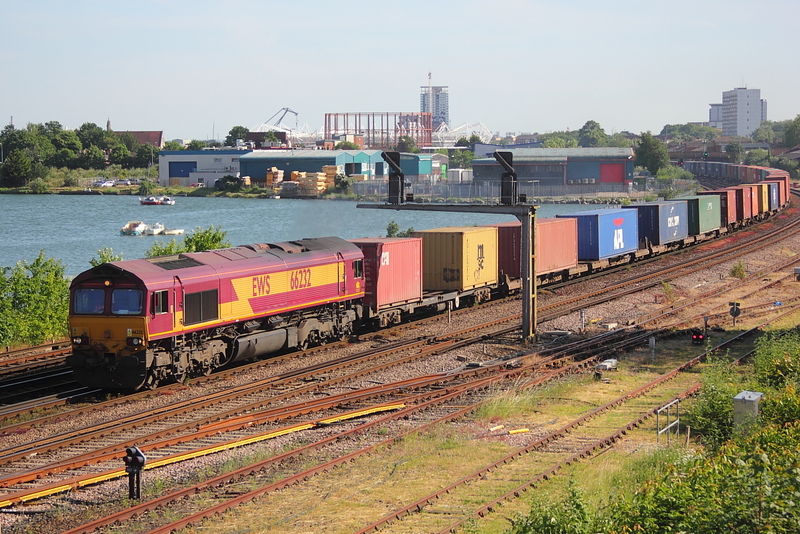 ​ 66112 4E68 Southampton docks to Wakefield europort inter- model. 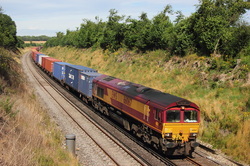 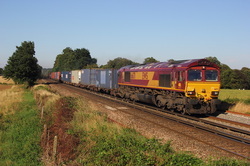 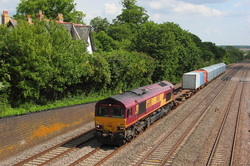 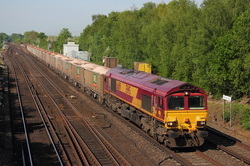 ​ 66181 6E03 Appleford to Milford flyash empty containers. 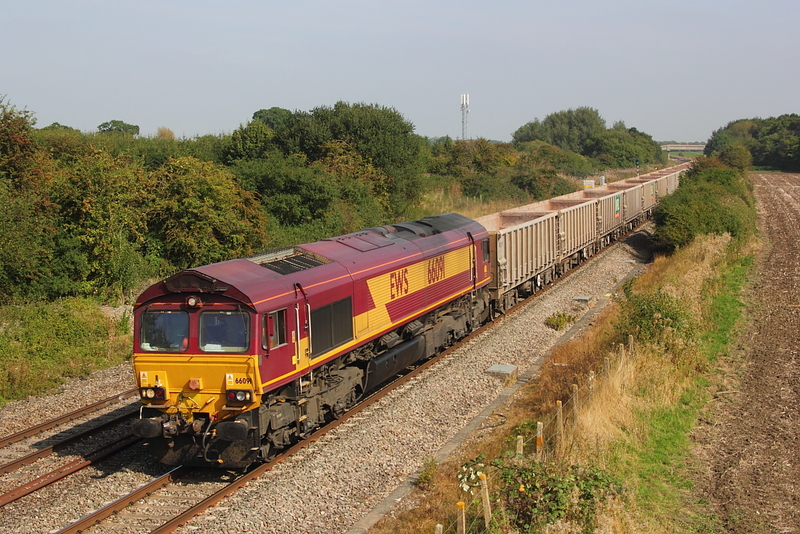 ​ 66183 6o30 Casle Bromwich to Southampton docks loaded Range Rovers. 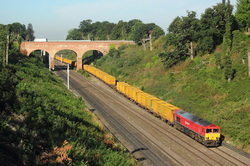 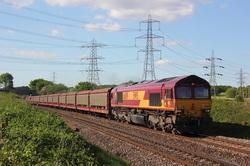 ​ 66183 6O30 Castle Bromwich to Southampton East docks loaded Range Rovers. 66118 6O42 Halewood to Southampton docks loaded car transporter. 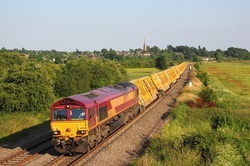 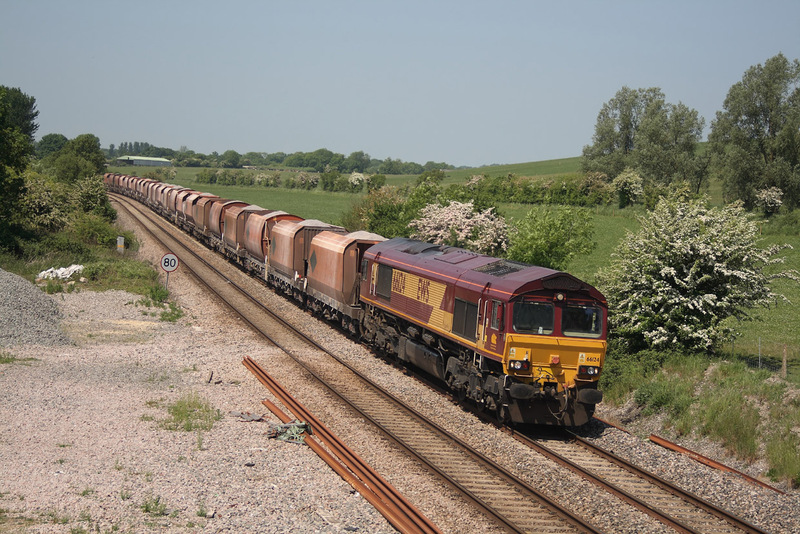 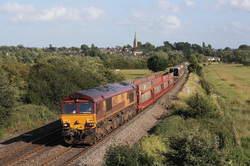 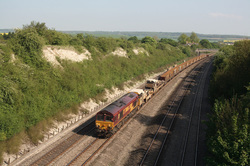 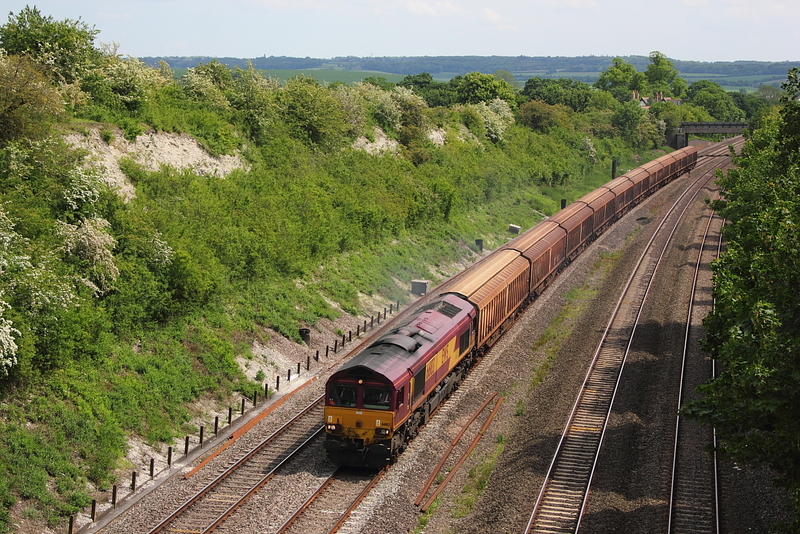 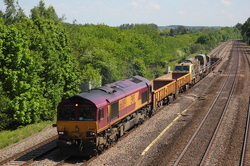 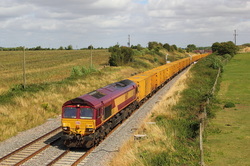 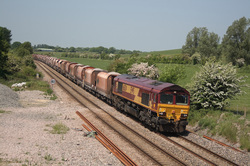 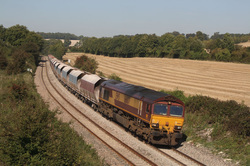 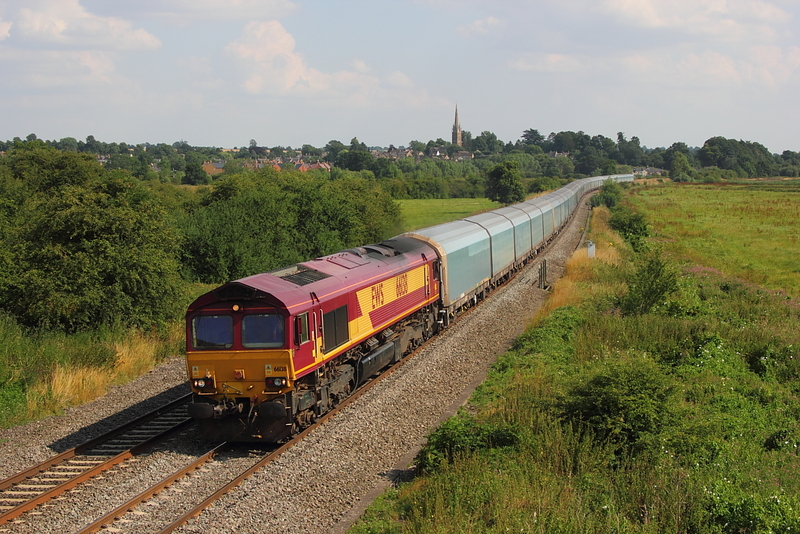 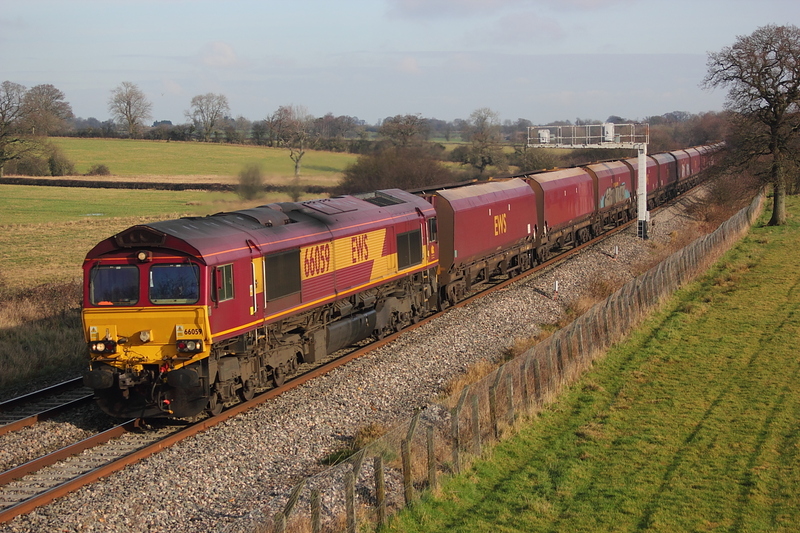 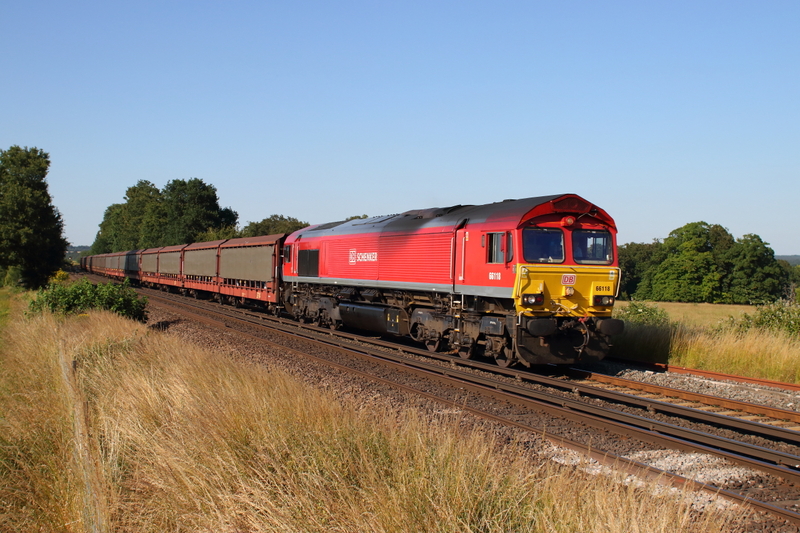 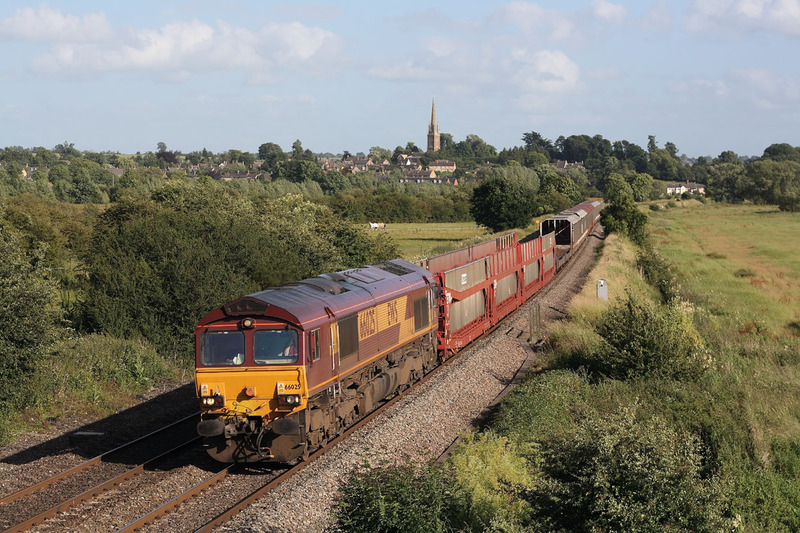 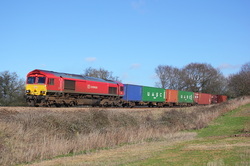 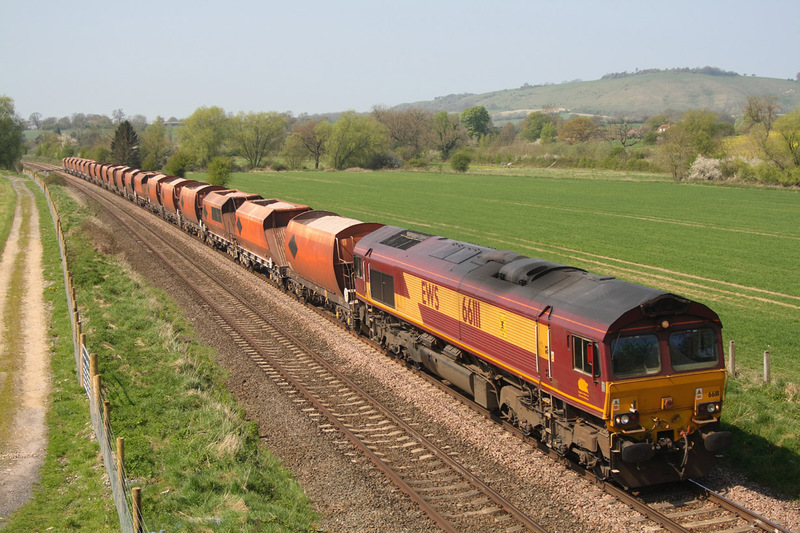 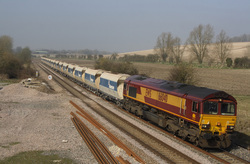 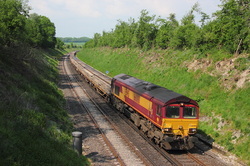 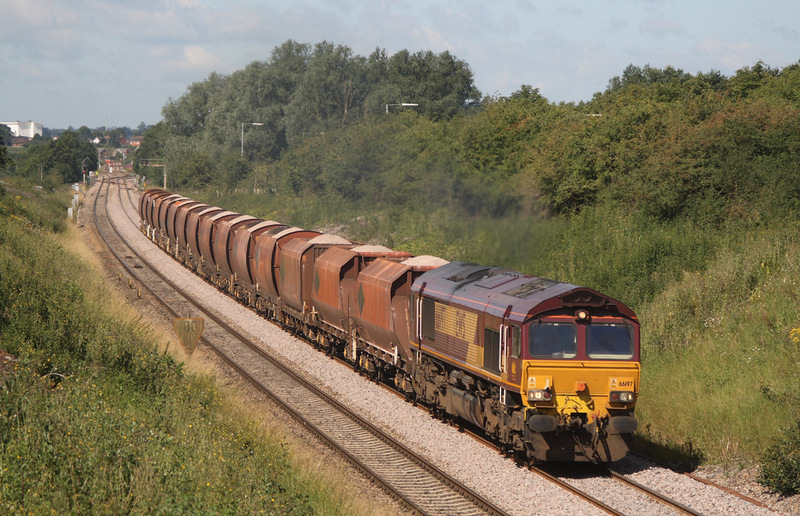 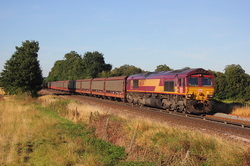 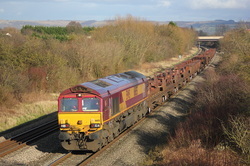 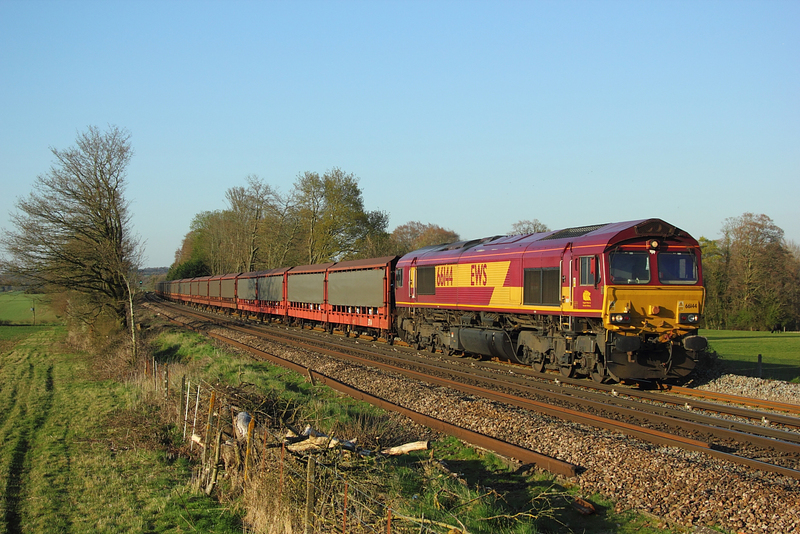 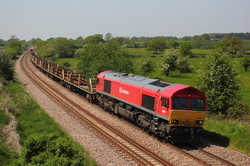 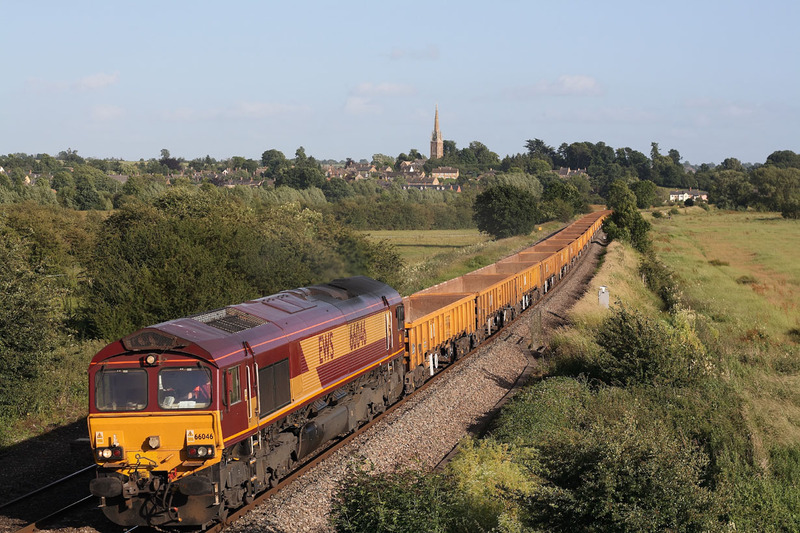 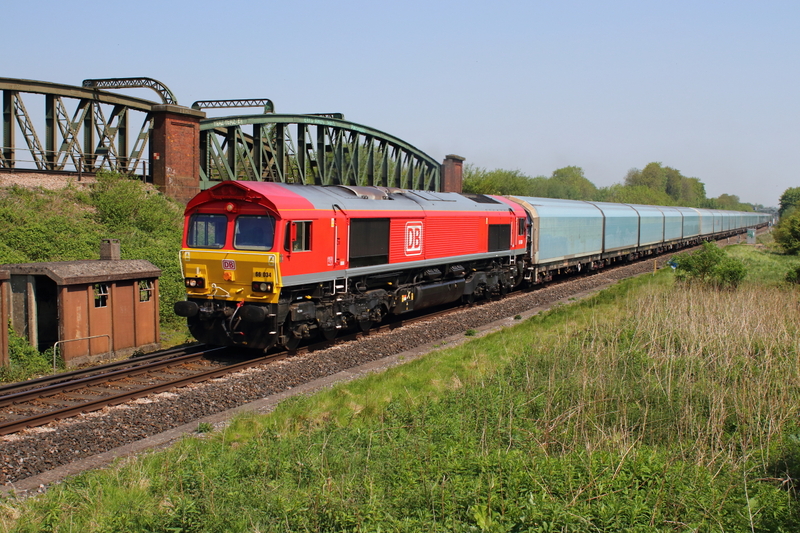 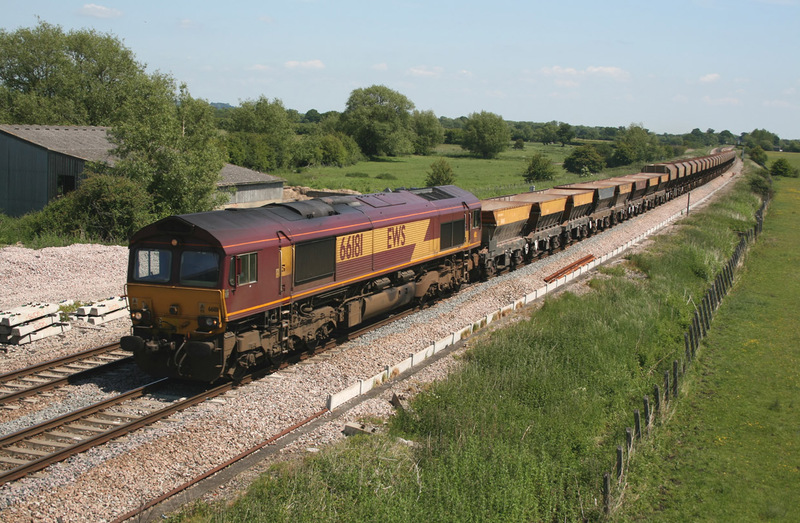 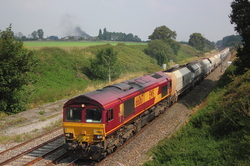 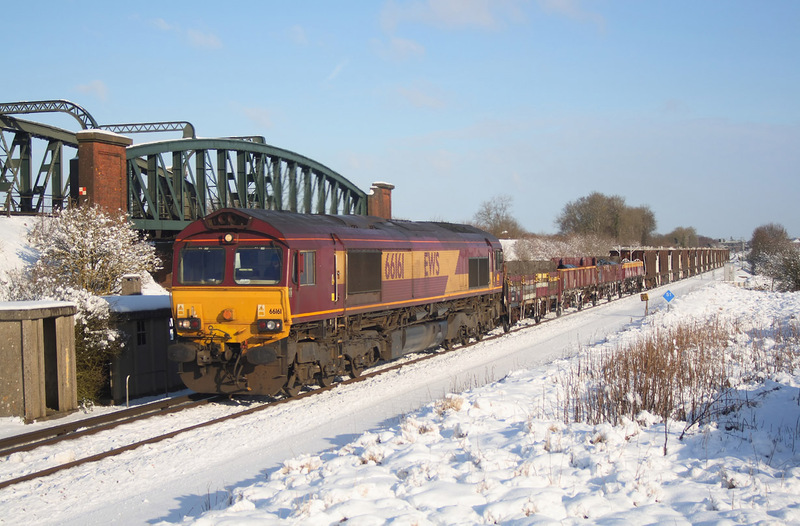 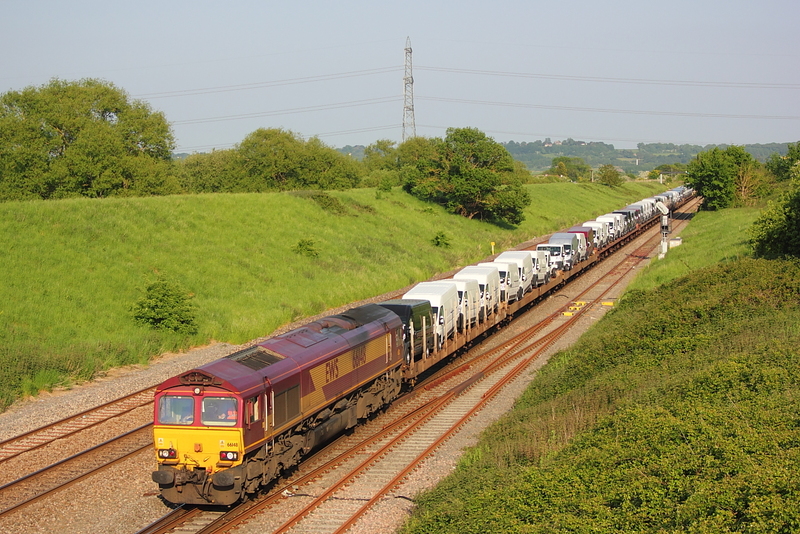 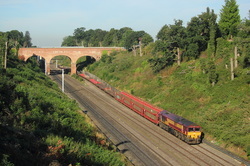 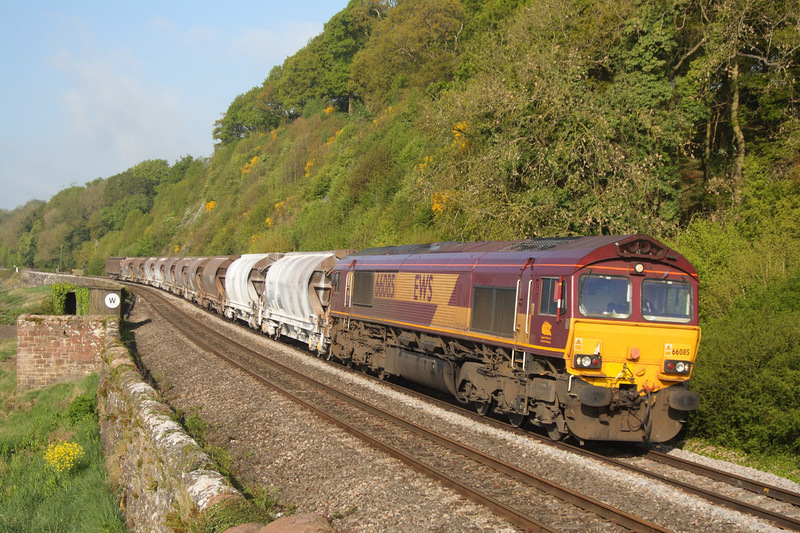 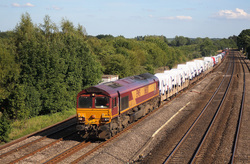 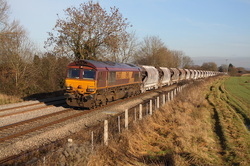 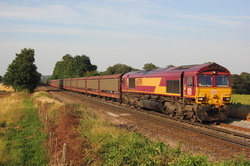 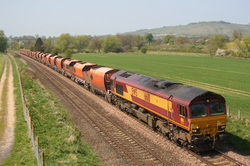 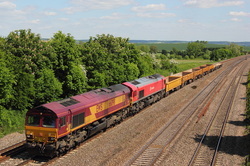 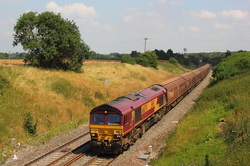 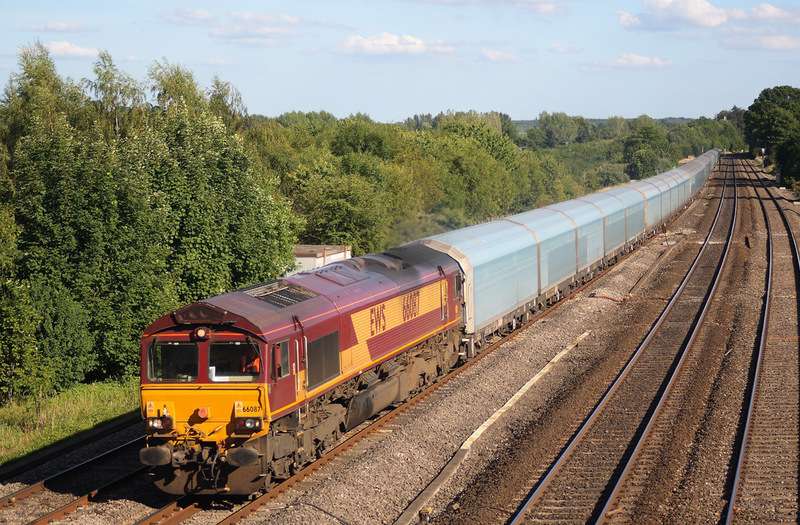 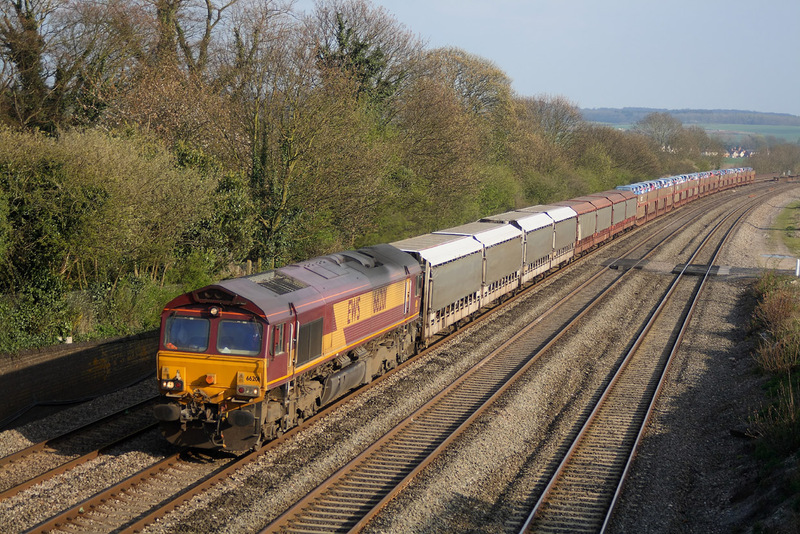 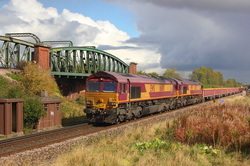 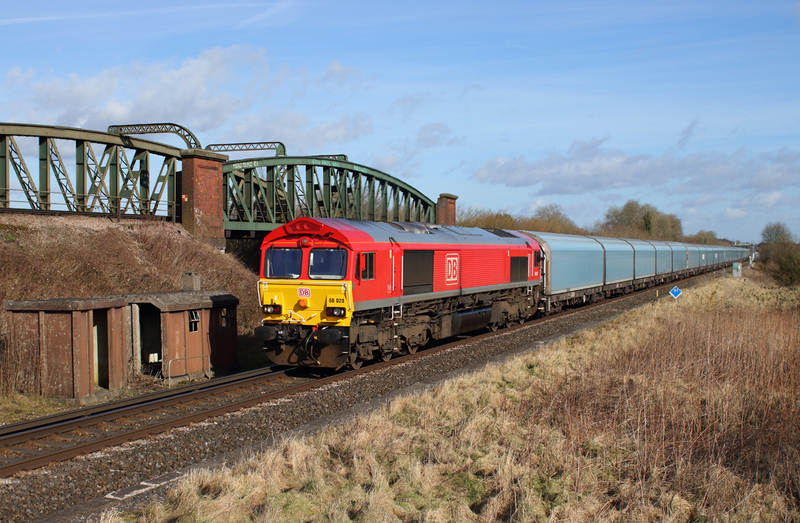 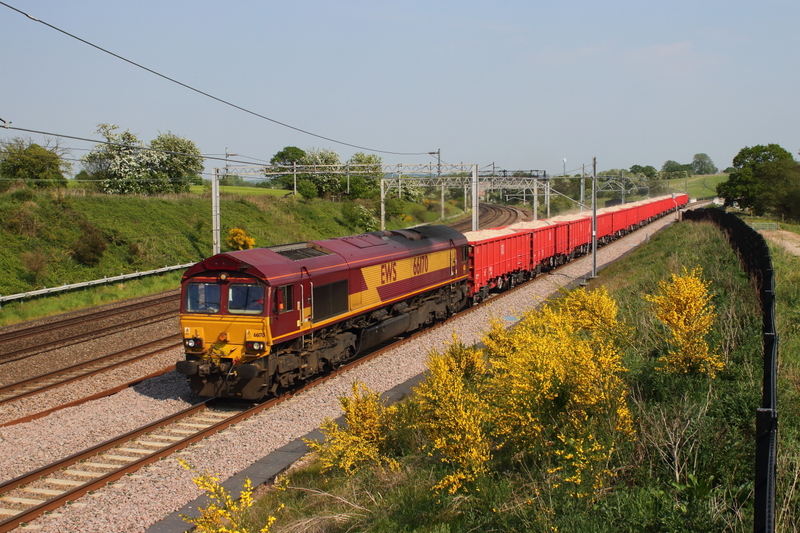 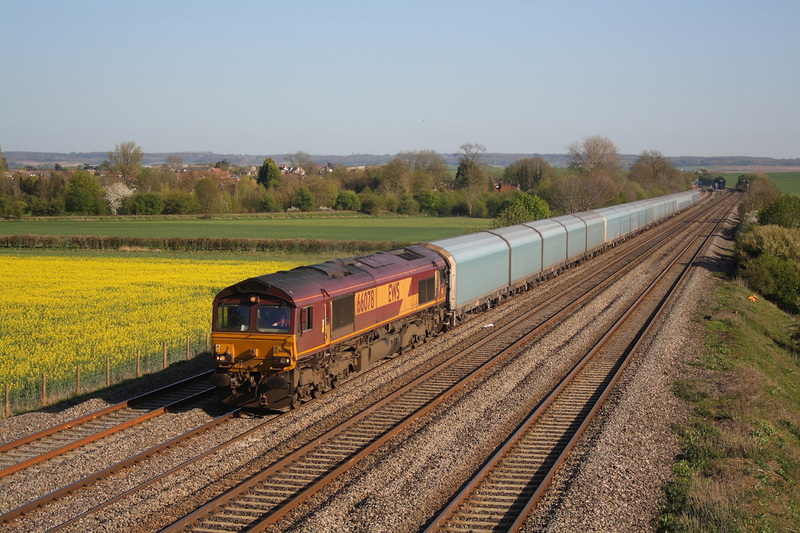 ​ 66170 6M88 Middleton Towers to Arpley loaded sand. 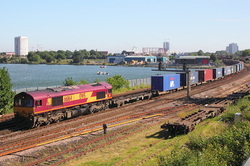 ​ 66034 4O39 Cowley to Southampton Docks loaded car transporter. 66003 Eastleigh to westbury engineers. 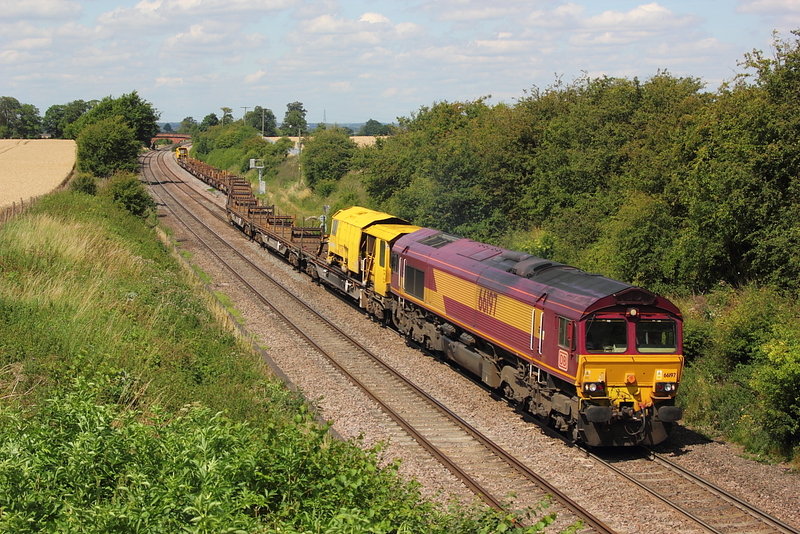 66044 pulls away from Towney loop with 6W16 Wooton Bassett to Westbury engineers. 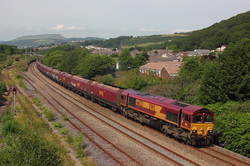 66087 6H35 Margam to East Usk Branch Birdport loaded steel. 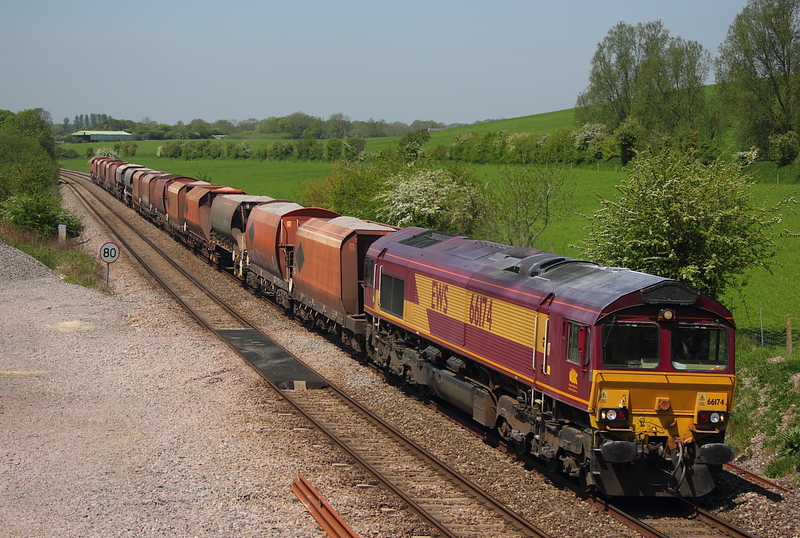 66127 6M70 Chesterton sidings to Mountsorrel empties. 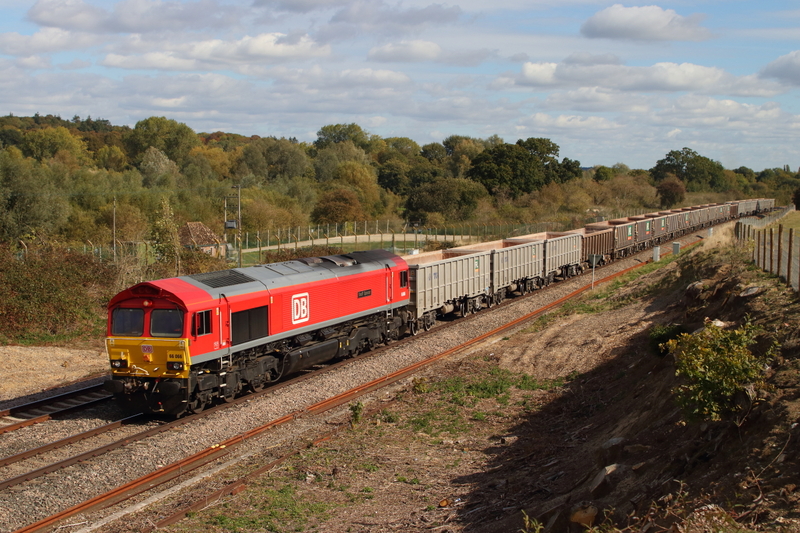 66162 4O40 Cowley to Southampton East docks loaded cars. 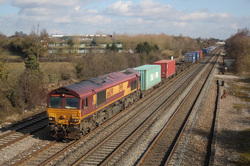 66152"Derek Holmes-Railway Operator" 6A03 Severnside to Brentford empty refuse containers. 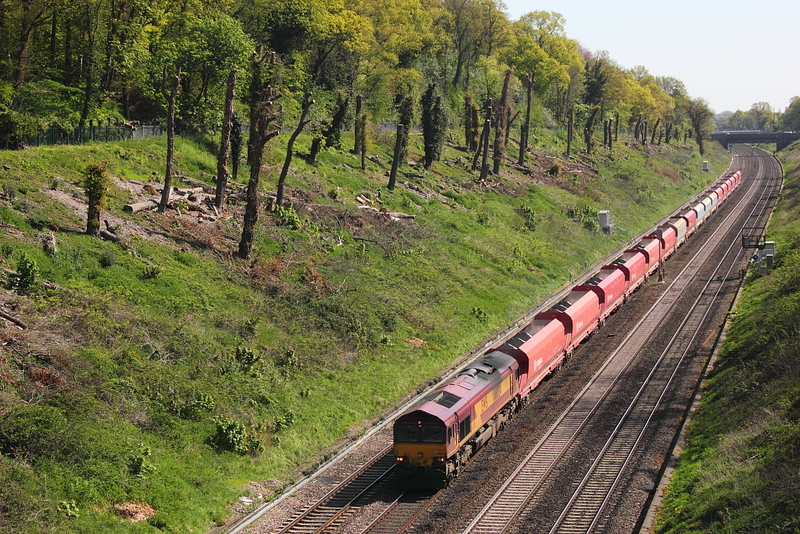 66131 6M20 Whatley to Churchyard sidings loaded stone. 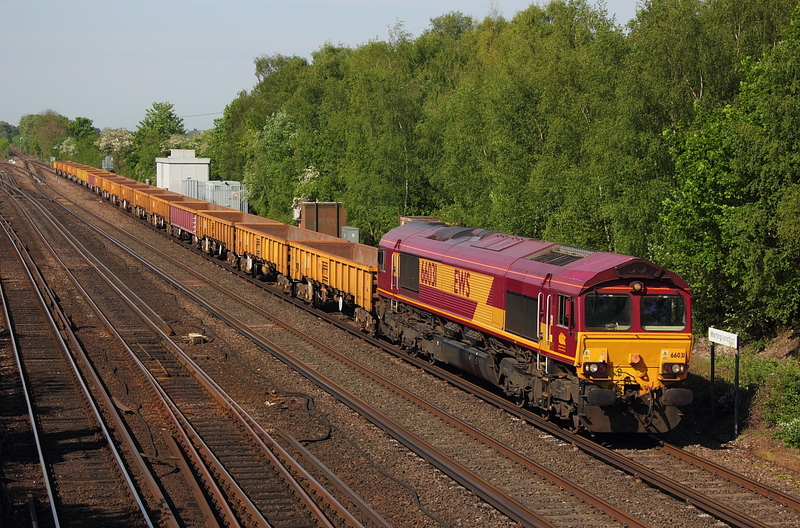 66090 6o42 Halewood to Southampton East docks loaded car transporter. 66003 6V41 Eastleigh yard to Westbury yard engineers. 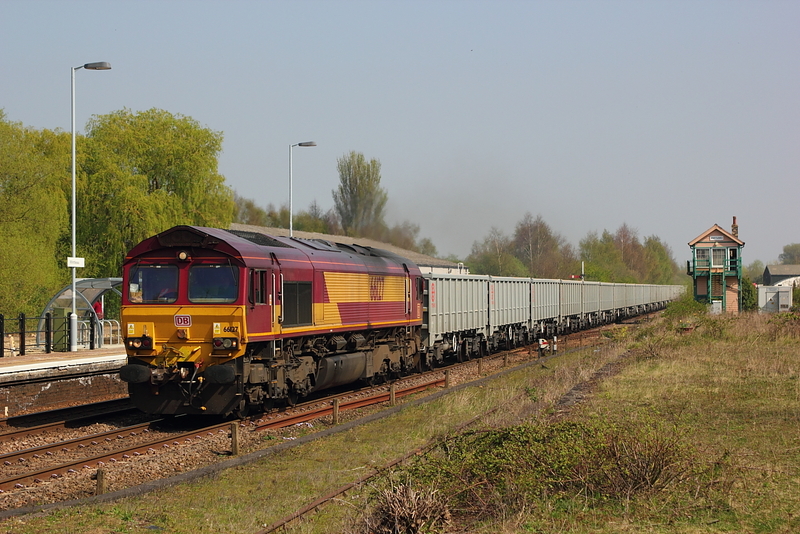 66101 6O42 Halewood to Southampton East docks loaded car transporter. 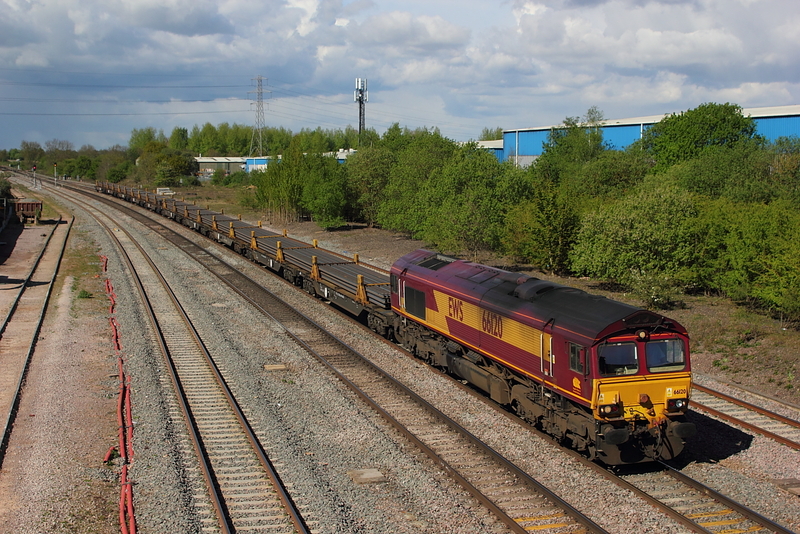 66082 4O21 Trafford Park to Southampton inter-model. 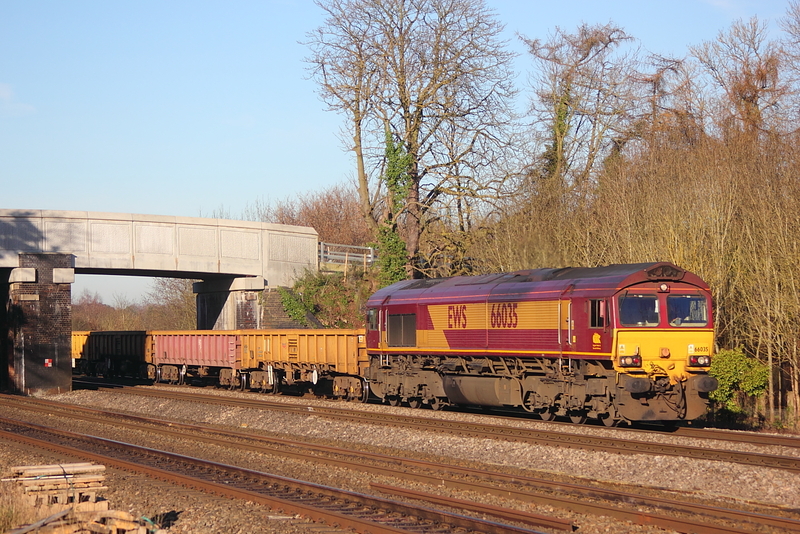 Passing under the A4 road bridge, 66117 on 6L35 Didcot yard to Dagenham empty car carrier. 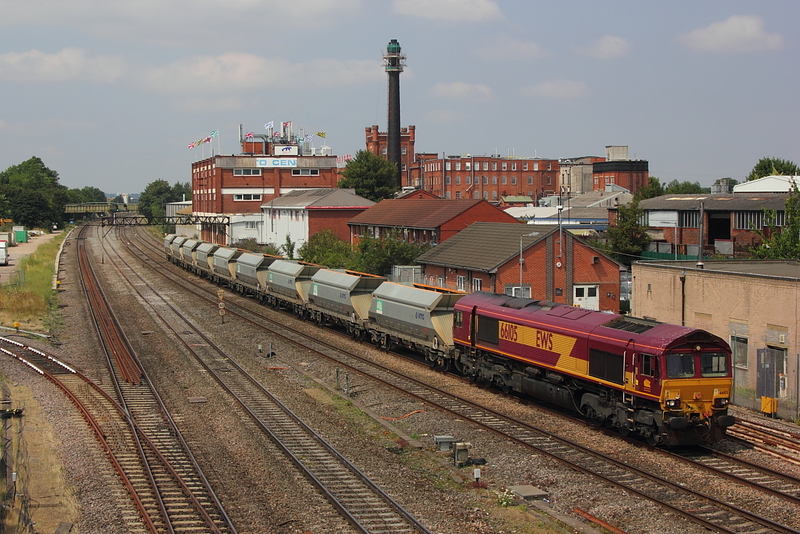 66118 6O46 Bescot up engineers sidings to Southampton East Docks loaded car transporter. 66197 departs Elford loop and onto the main line with 6O01 Doncaster up Decoy to Eastleigh East yard. 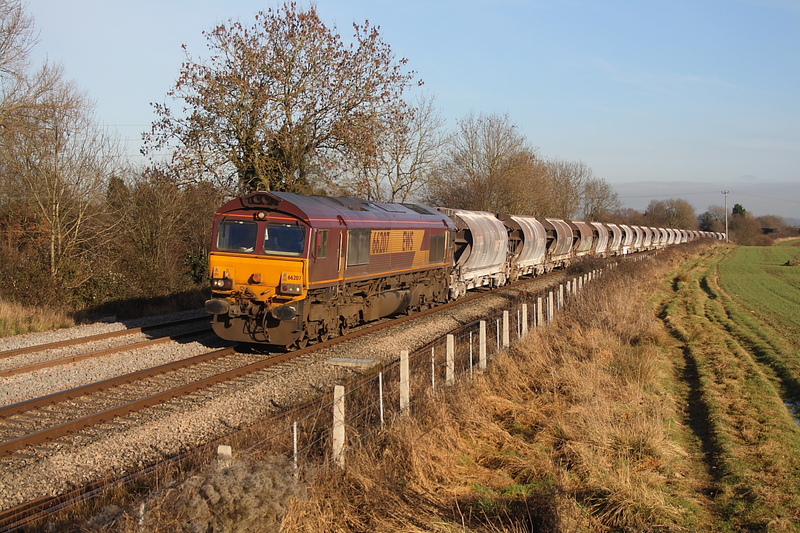 66099 finally departs Elford loop with 6M57 Lindsey to Kingsbury loaded tanks. 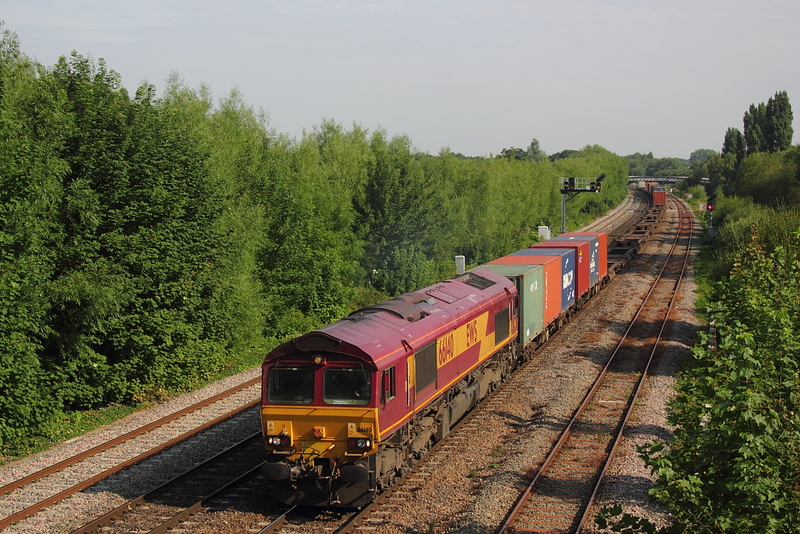 66119 6M44 Southampton East Docks to Halewood empty car carriers. 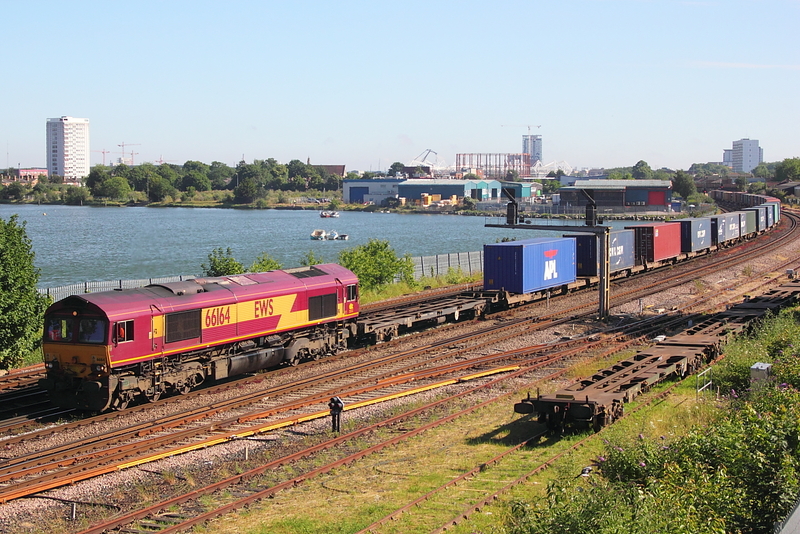 66136 4M66 Southampton West docks berth 109 to Birch Coppice inter-model. 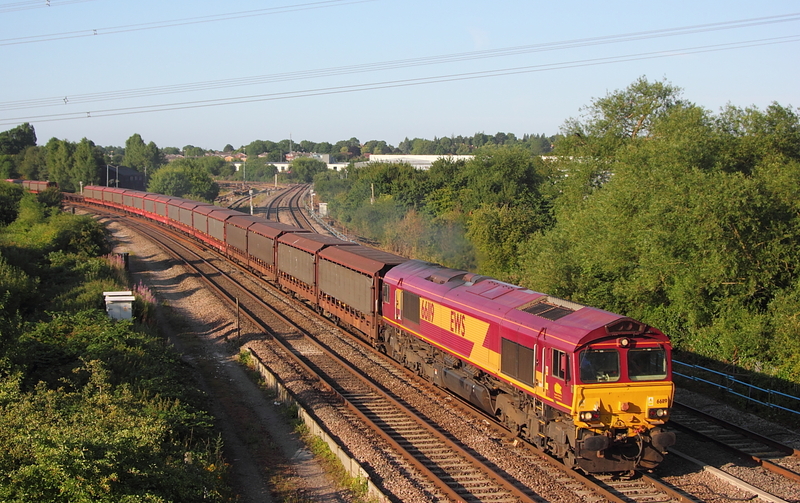 Running over 2 hours late,66109 passes on 6L35 Didcot yard to Dagenham Docks empty car transporter. 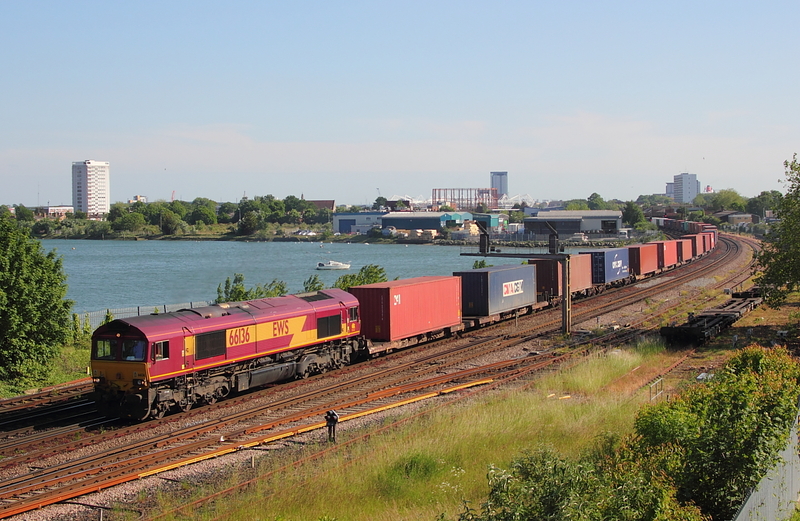 66250"EWS Energy" 4M66 Southampton West Docks berth 109 to Birch Coppice exchange sidings inter-model. 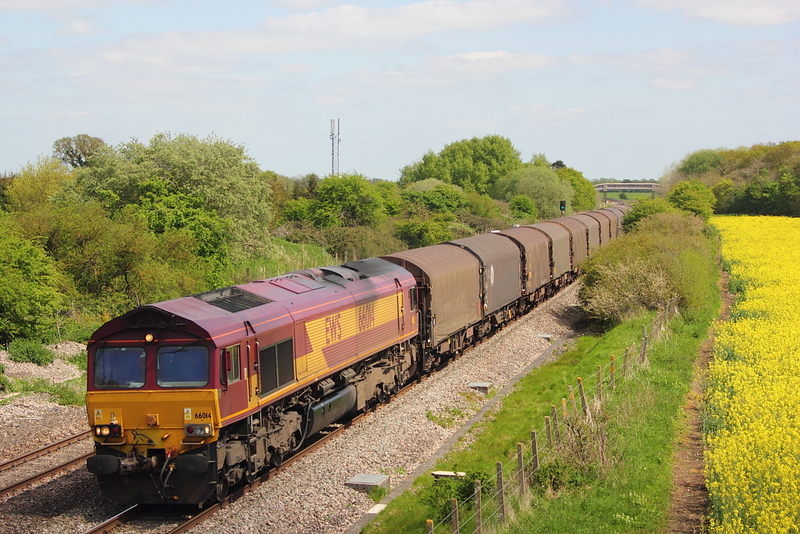 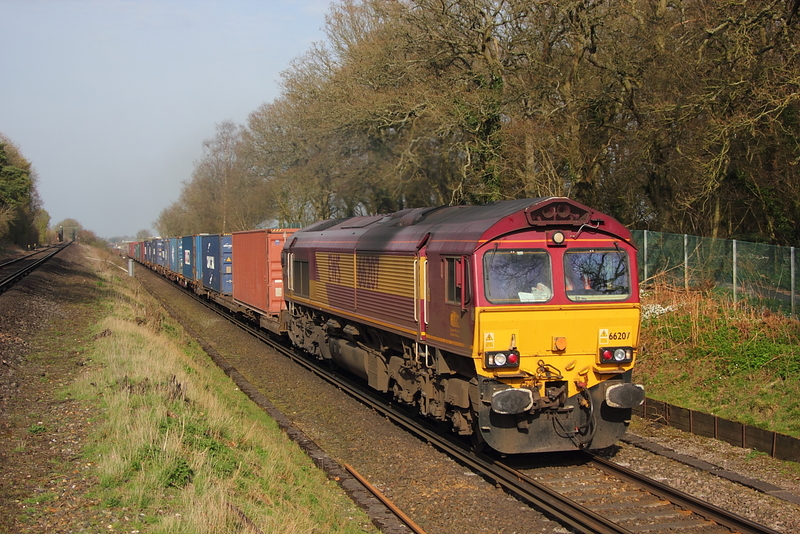 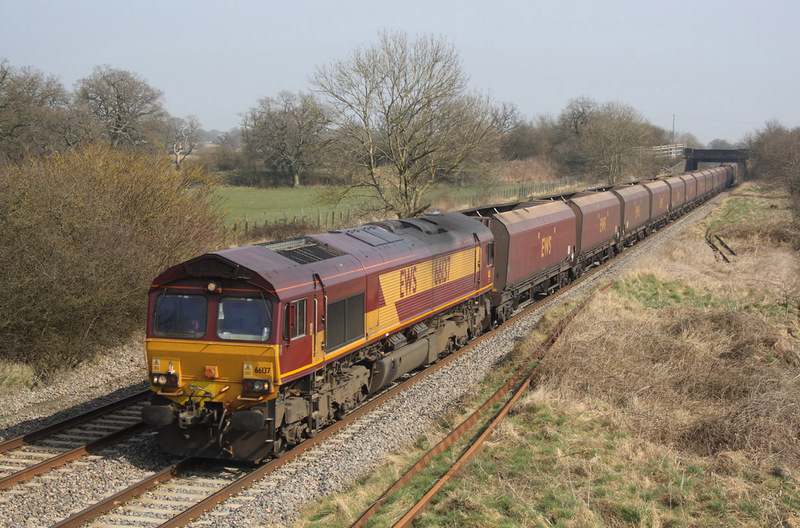 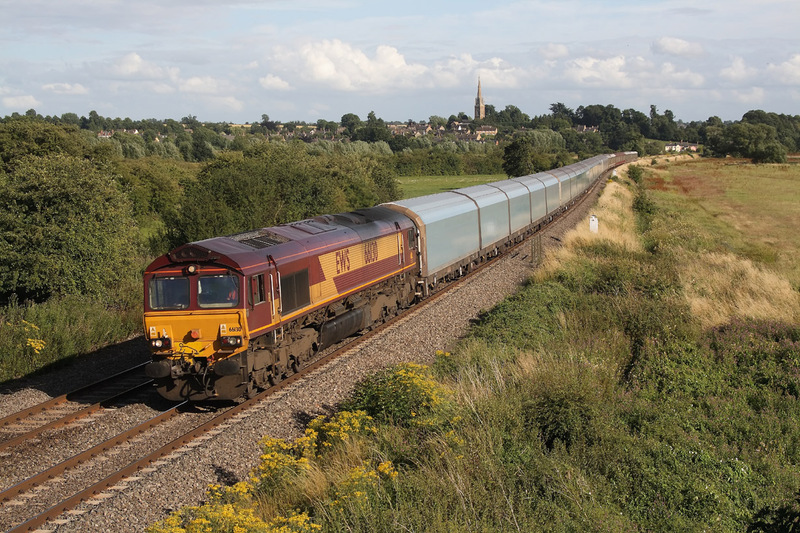 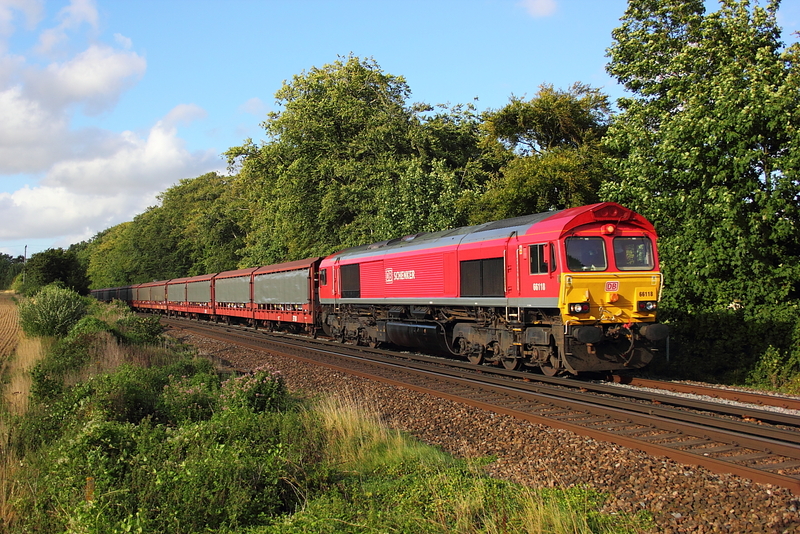 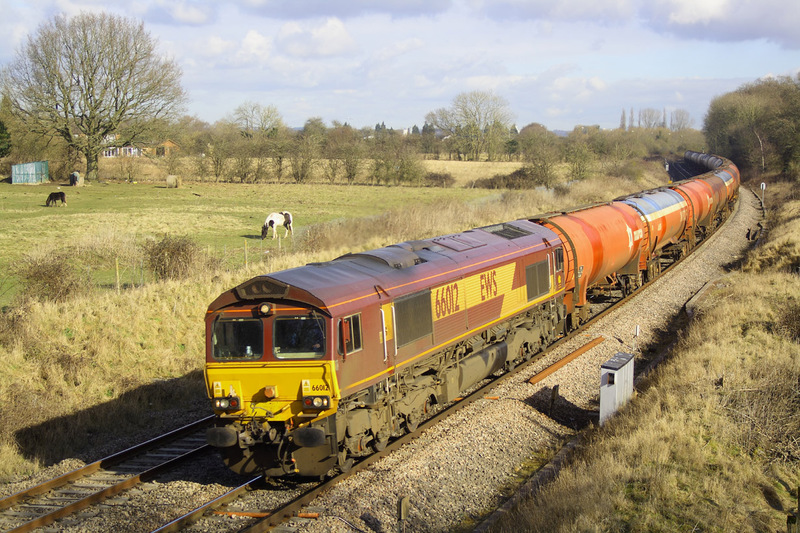 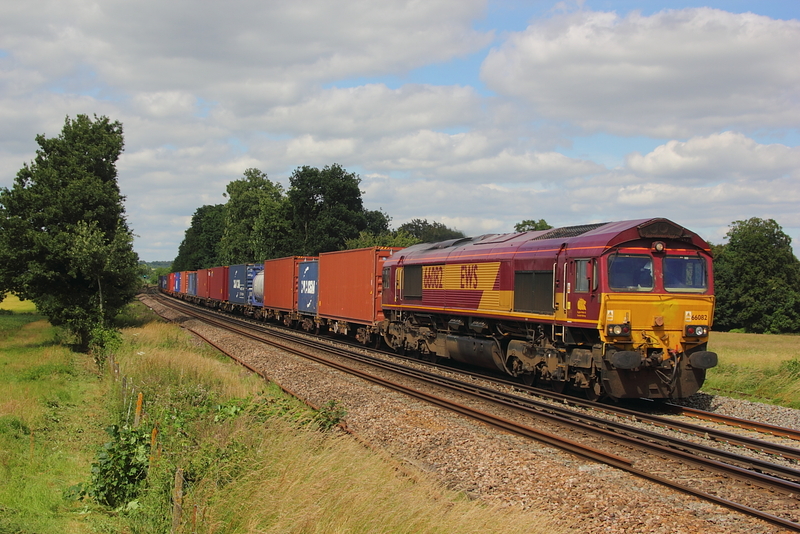 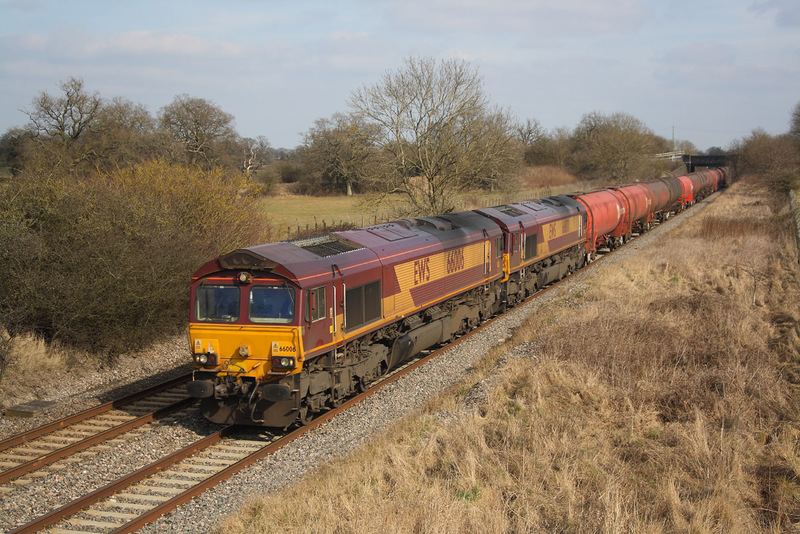 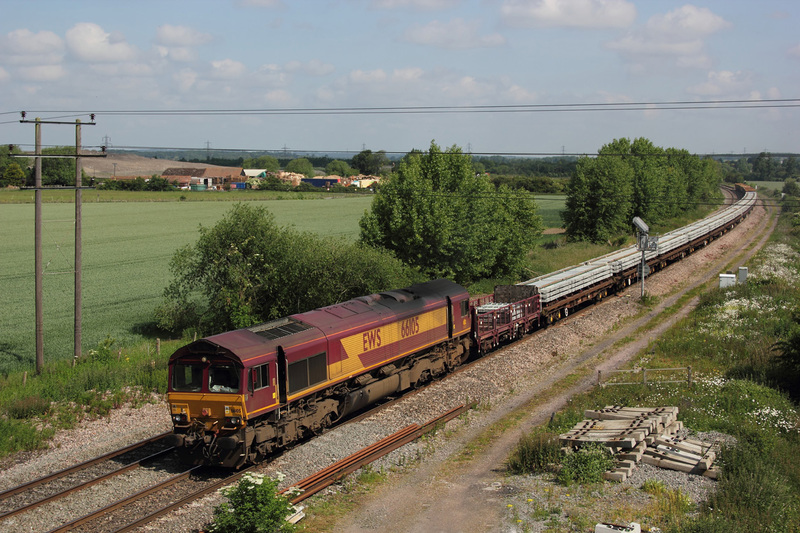 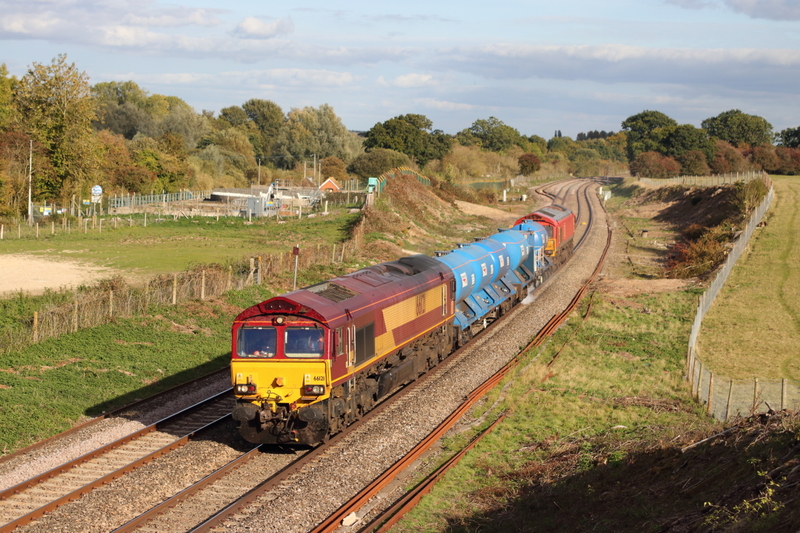 66098 6Z23 Thorney Mill to Appleford tip. 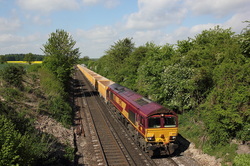 66021 6W23 Hinksey Yard to Slough West ballast. 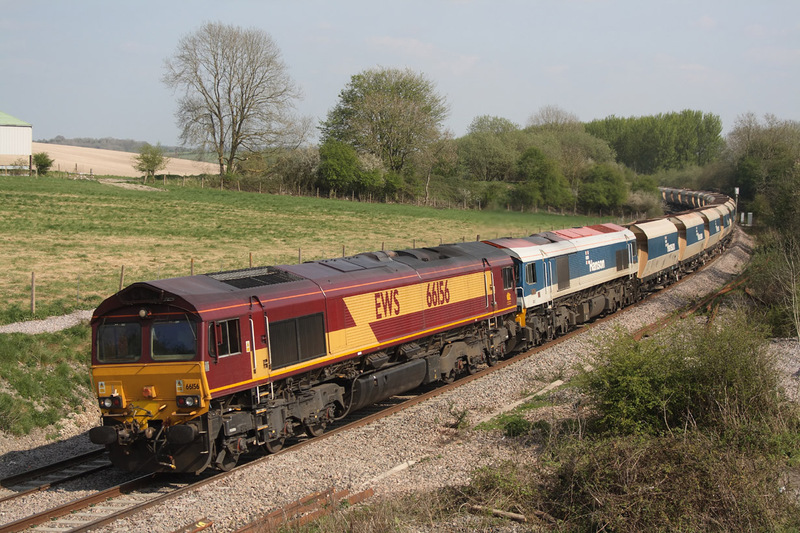 With 60091"Barry Needham" DIT destined to be Eastleigh super shunter after a swap with 60045....66044 passes Worting Jnct. 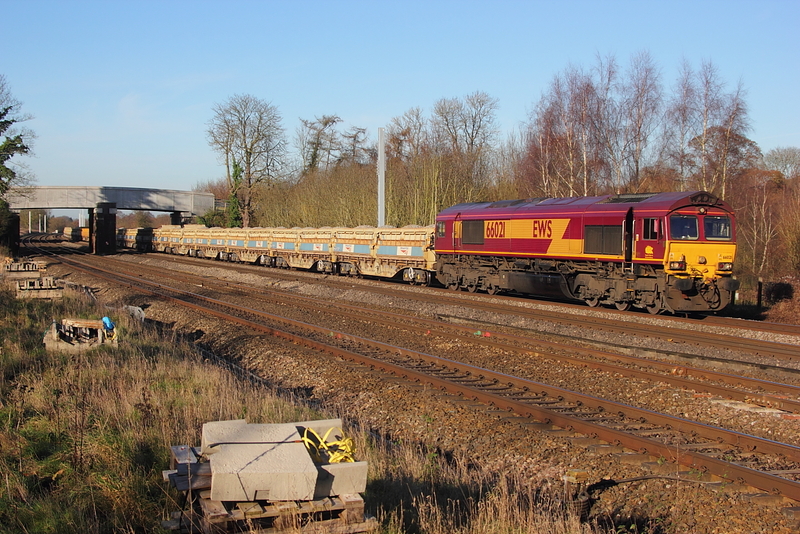 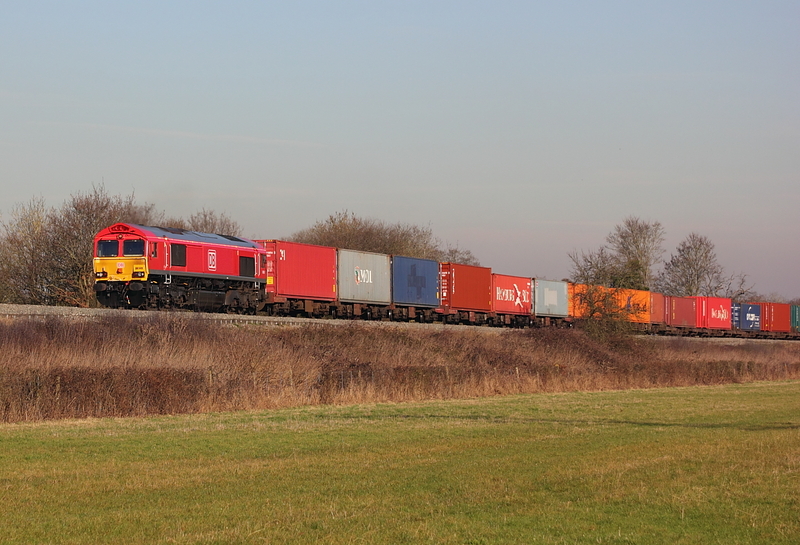 in ever lengthening shadows with 6Z01 Scunthorpe to Eastleigh loaded rails. 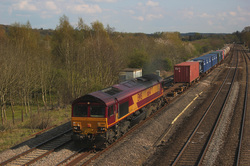 66140..4053 Wakefield to Eastleigh inter model. 66074 6v47 Tilbury to Trostre empty cargowagons. 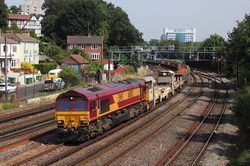 66109..6A69 Theale to Acton yard empties. 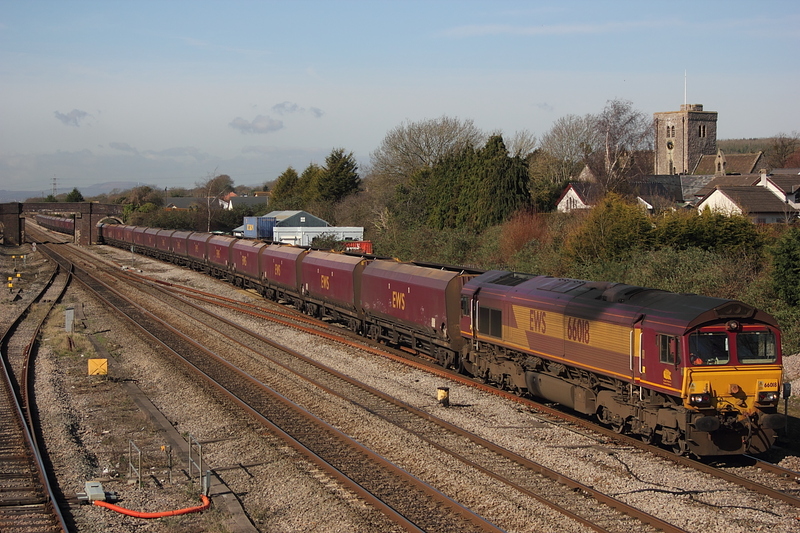 66199..6O26 Hinksey yard to Eastleigh conveying 37406+37410+37416 DIT from Didcot yard after 6X12 was earlier caped there. 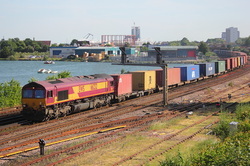 66232.4E70 Southampton Western Docks Berth 109 to Wakefield Europort intermodal. 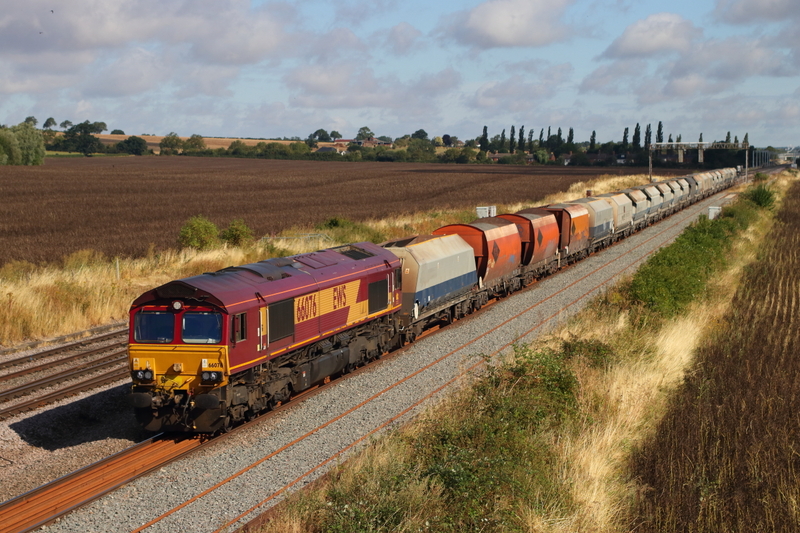 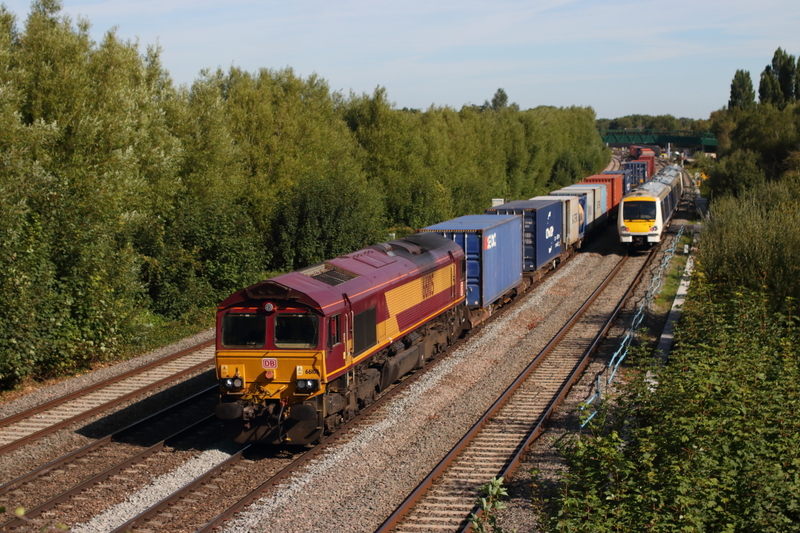 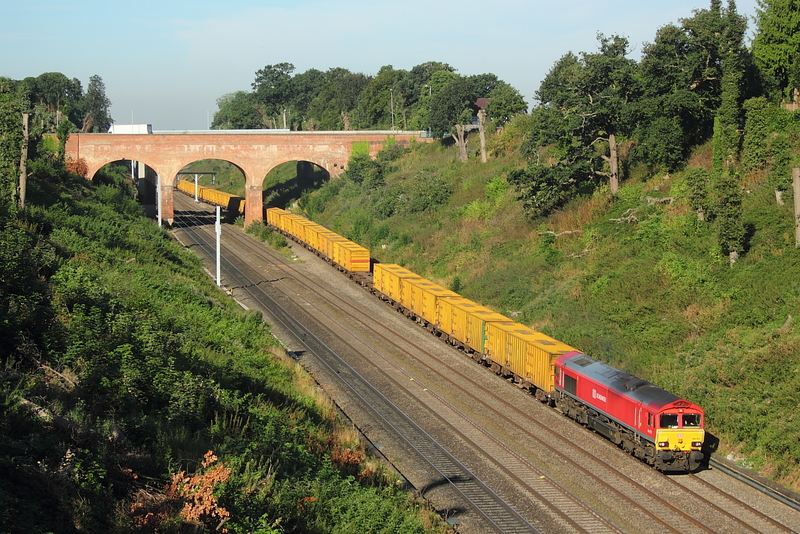 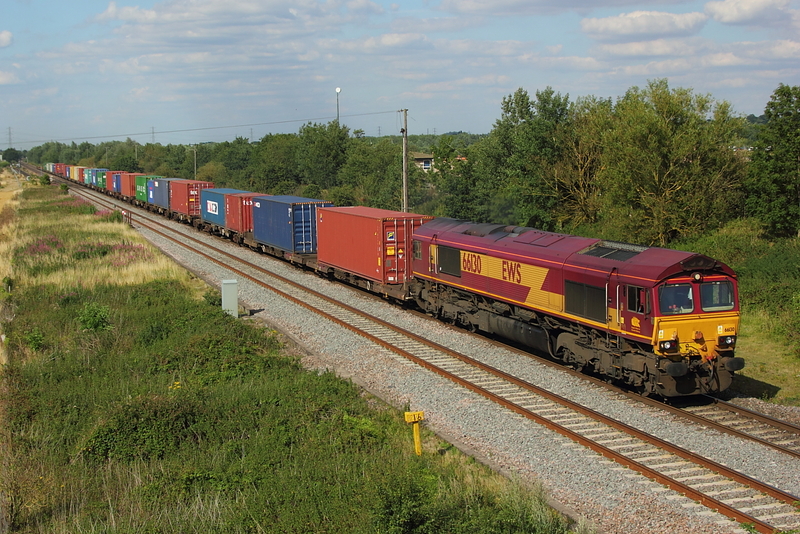 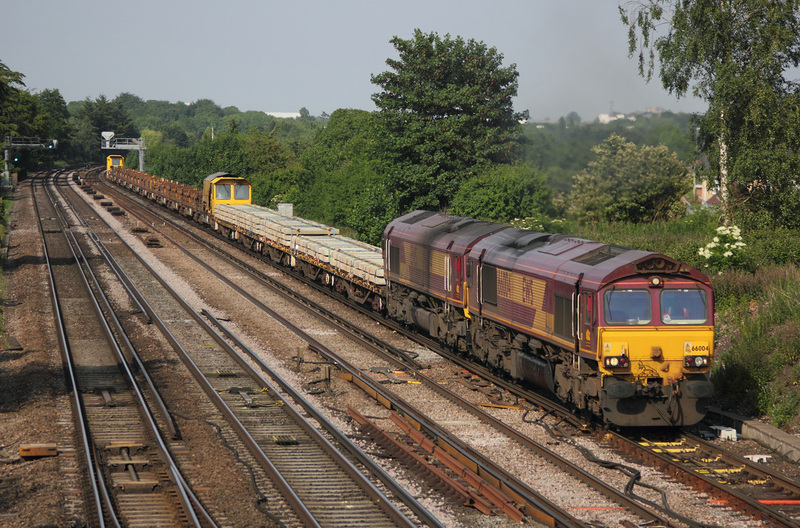 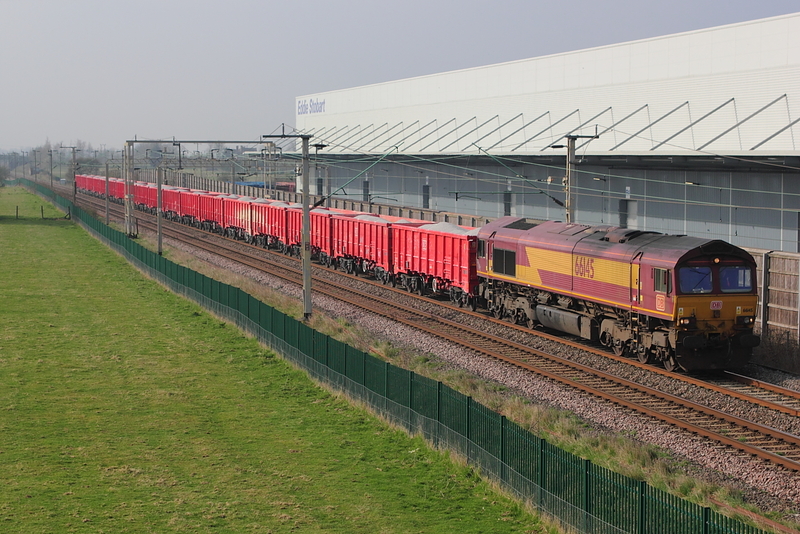 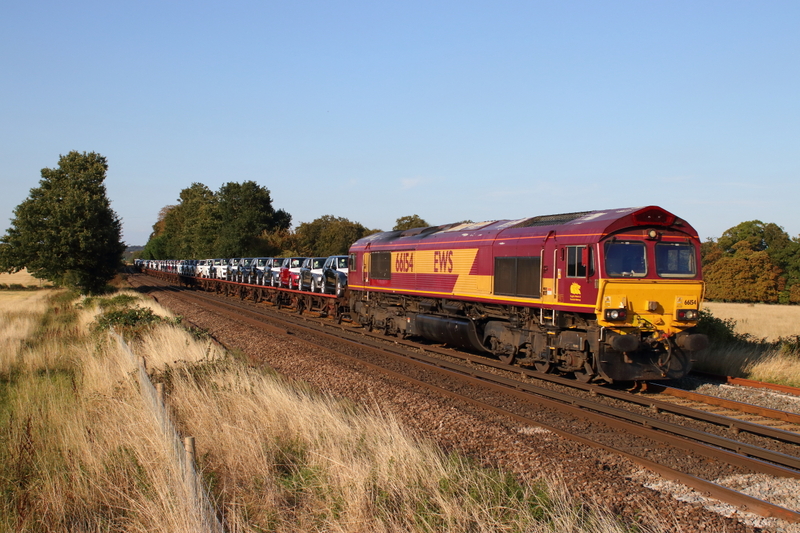 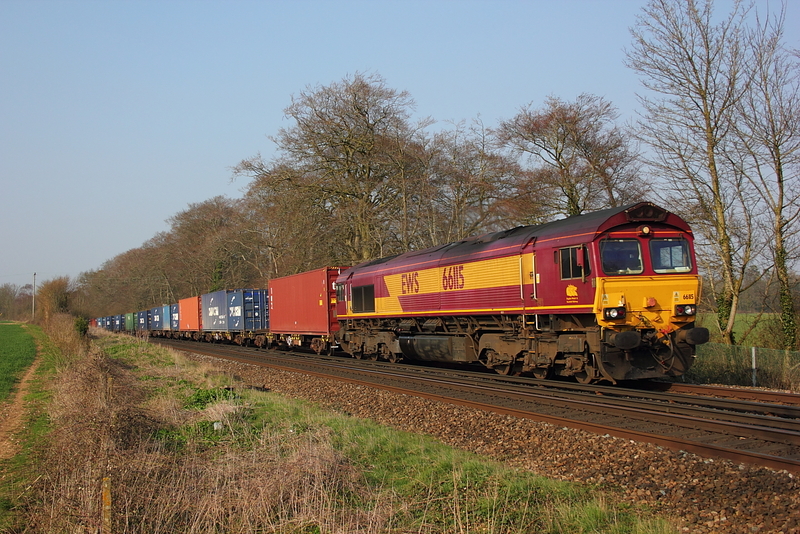 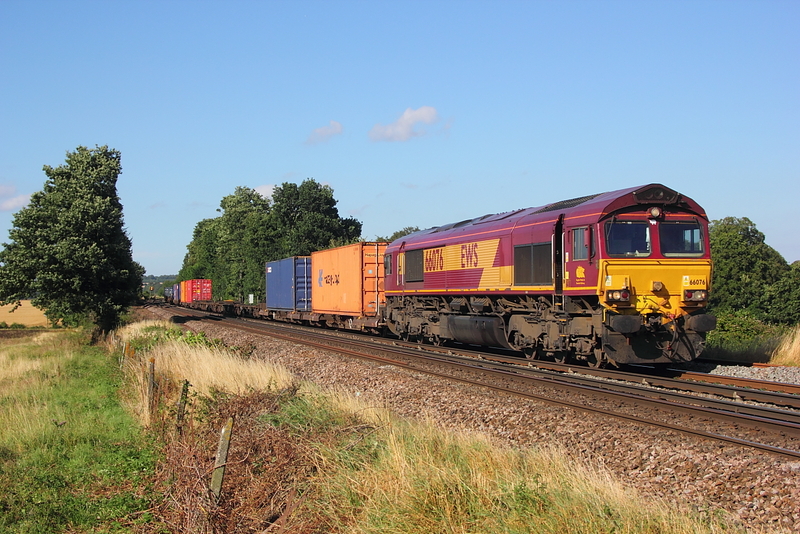 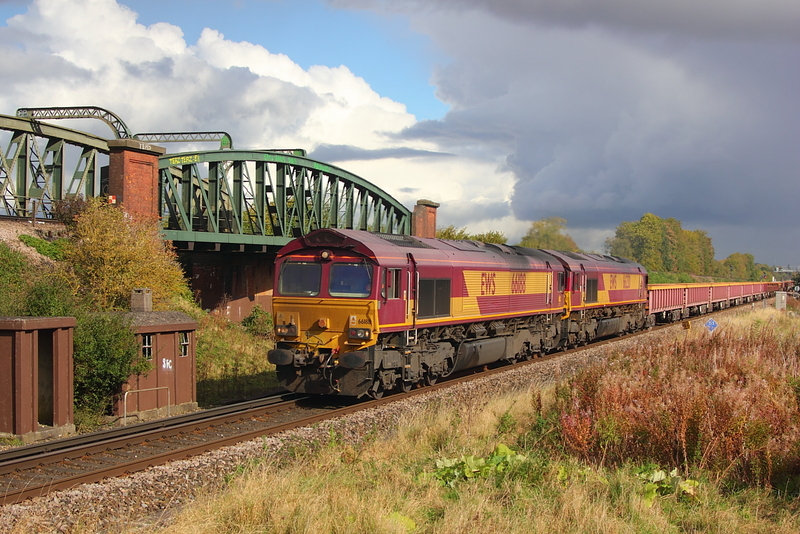 66183..6V47 Tilbury to Trostre works. 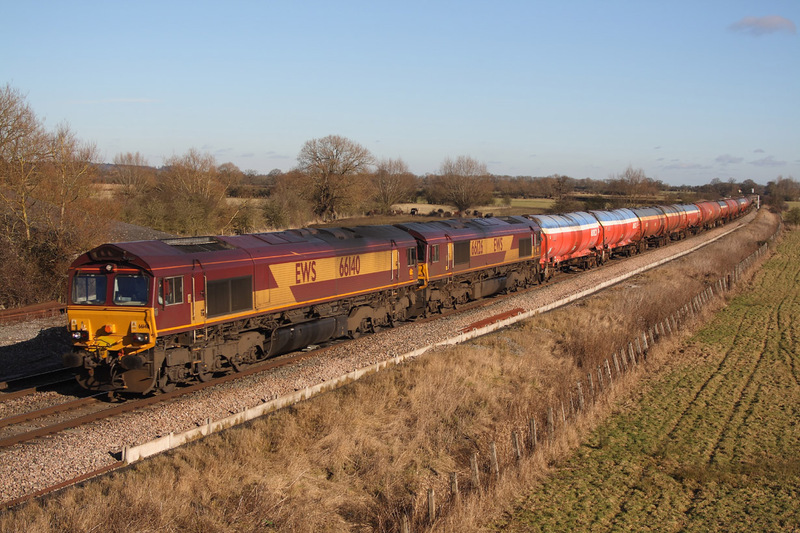 66031..6M26 Eastleigh to Studd Farm empties. 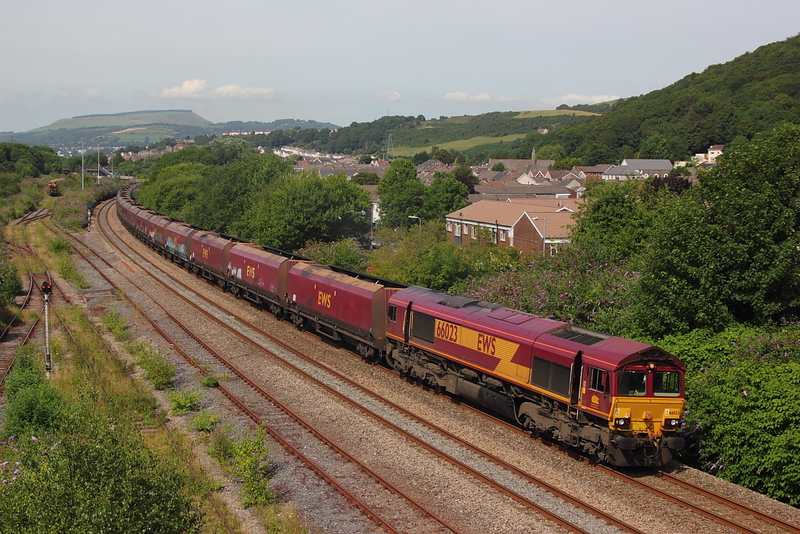 Running barely 4 minutes behind B33,66113 passes by in the same sunny spell ,working 6V13 Dollands Moor to Margam steel empties.Didnt see the sun for the rest of the day after that. 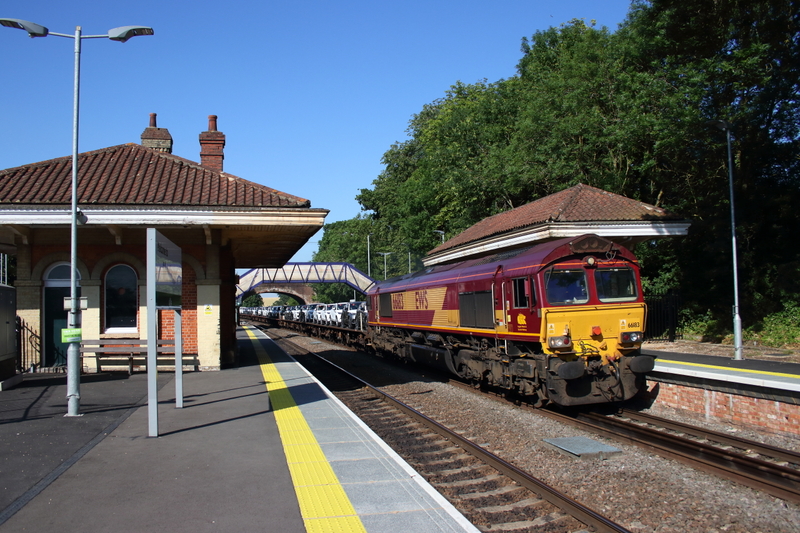 Only went for 6V27 Eastleigh to Hinksey engineers as reports suggested that tug71 would be DIT,but in reality 66089 was in sole charge. 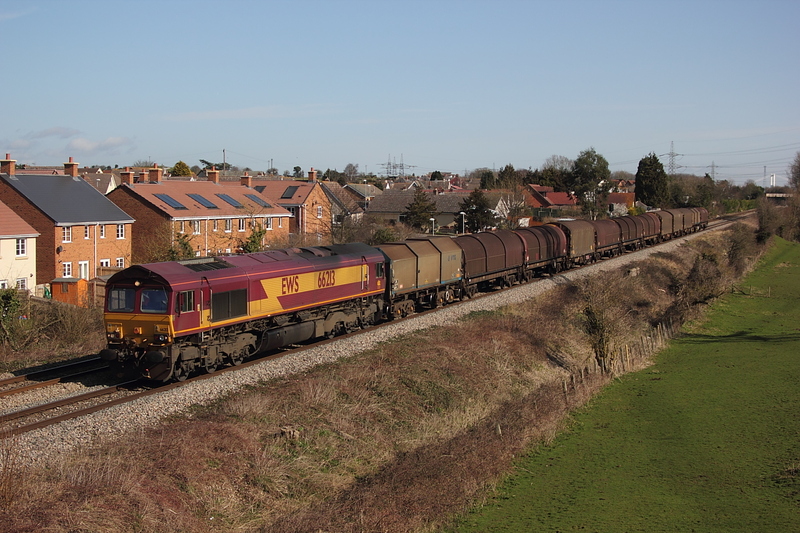 The reason for the visit to Badgeworth was a chance of a second DCR grid on a Saturday,after getting the Didcot flyash working earlier...NO CHANCE,it was never going to be was it,so ended up with this as a poor substitute,subject being 66155 on 6V92 Corby to Margam coil empties. 66188+66230 6O27 Hinksey Yard to Eastleigh Yard. 66067..4o23 Hams Hall to Southampton inter-model. 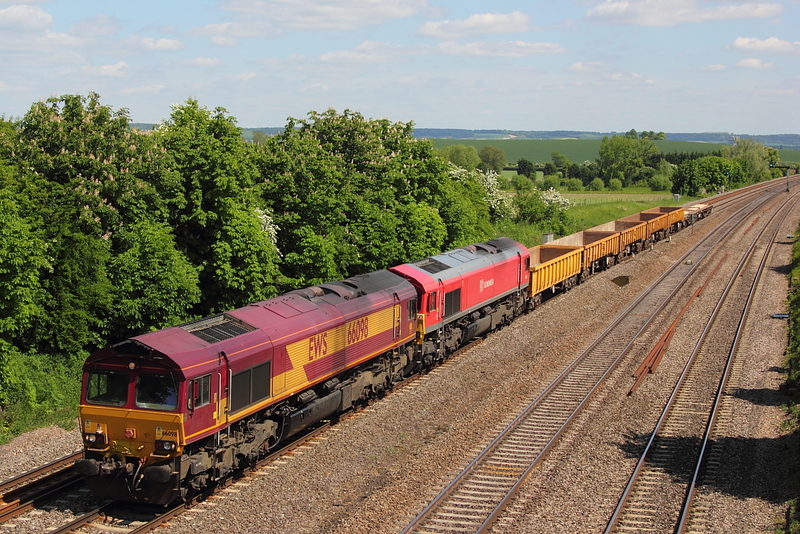 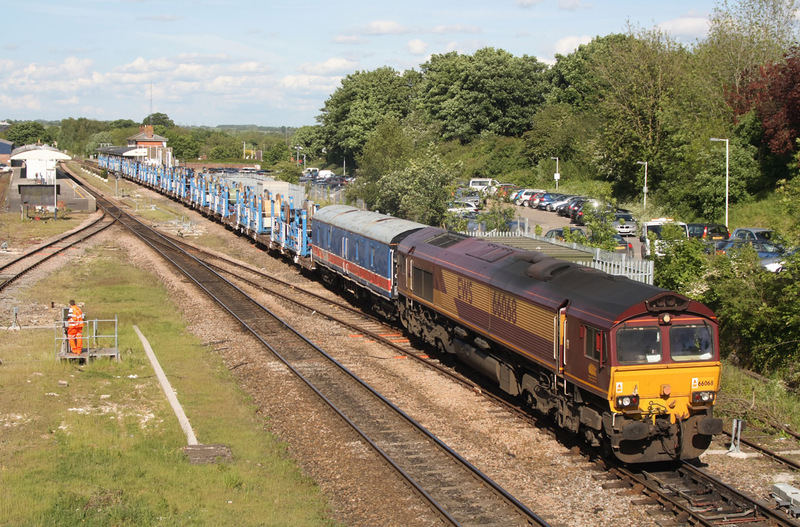 Bit of a overkill,but more than likely 66119 with 66041+66174 hitching a ride to Didcot yard on 6X44, Ford Transits and cars from Dagenham captured passing Cholsey. 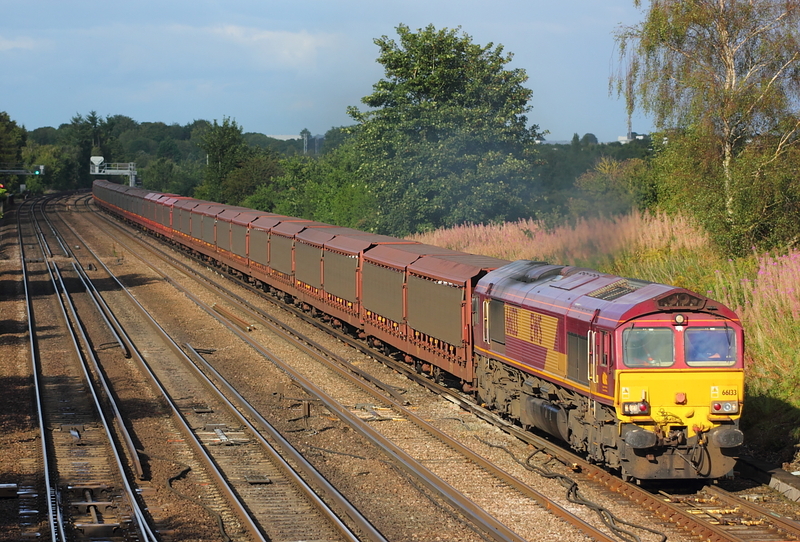 66174..6M20 Whatley to St.Pancras loaded hoppers. 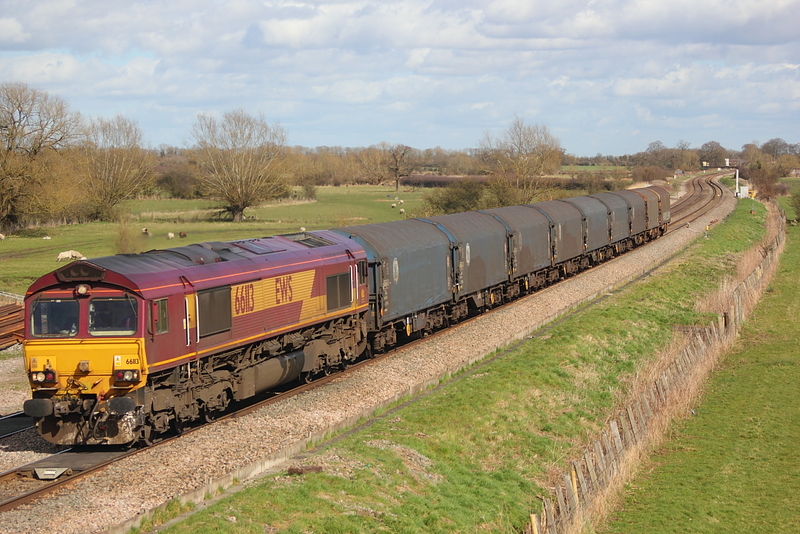 As already mentioned on the previous image below,66147 was also heavily delayed due to a fire on the 70 at Bramley,but gave an advantage of getting the sun on the nose instead of the usual backlit scenario on 6V38 Marchwood to Didcot yard.Seconds later it was lights out as a black shower cloud edged nearer. 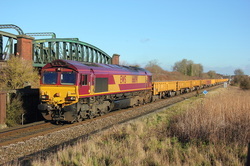 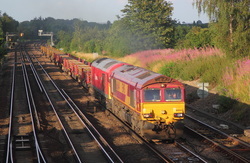 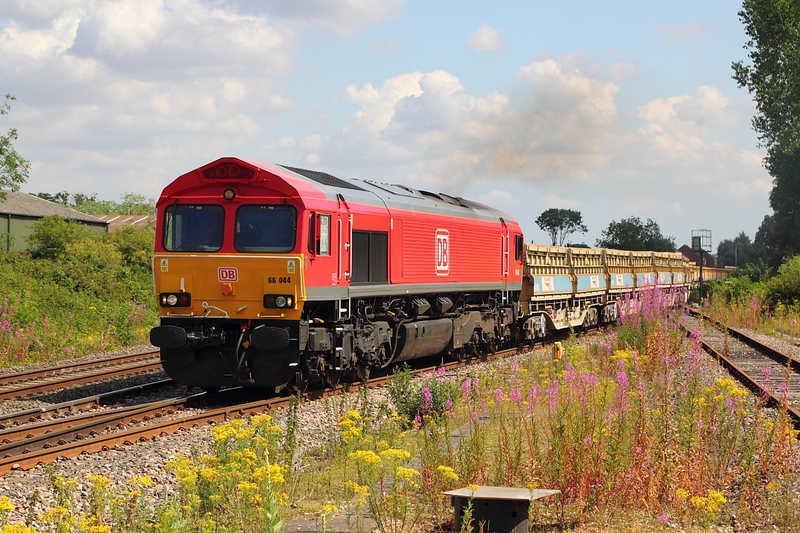 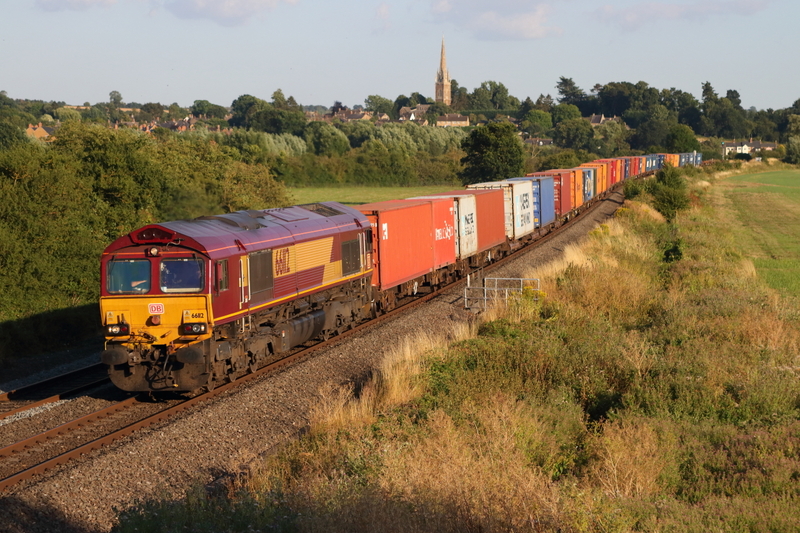 66059..4D10 Didcot P.S. to Avonmouth empty coal hoppers. 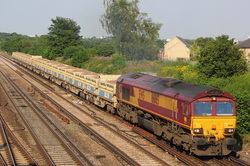 66004+66174..6Y42 Hoo Jnct. 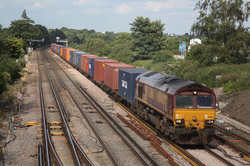 to Eastleigh. 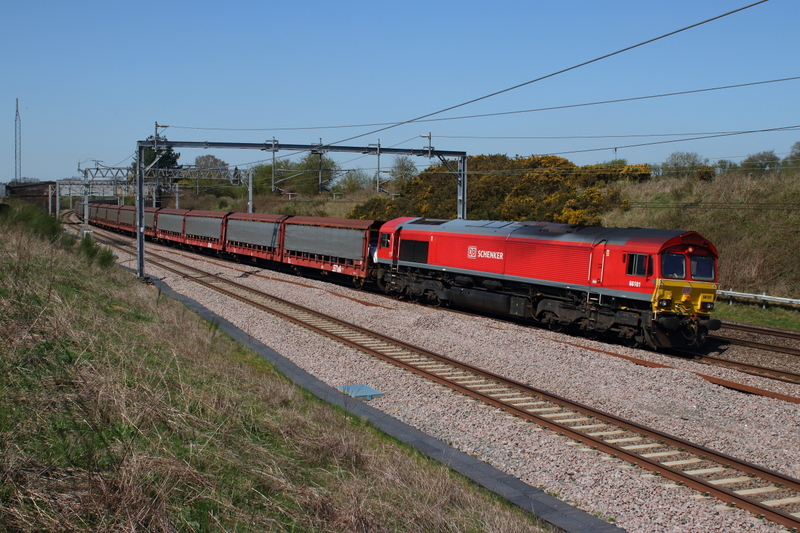 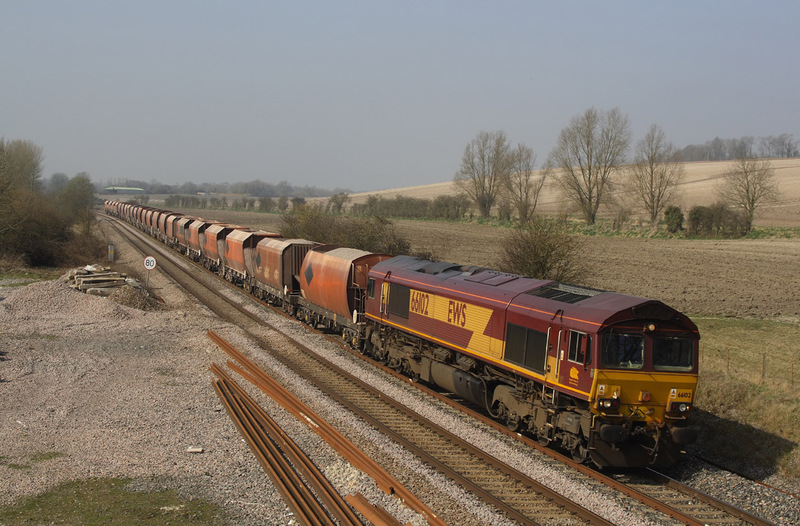 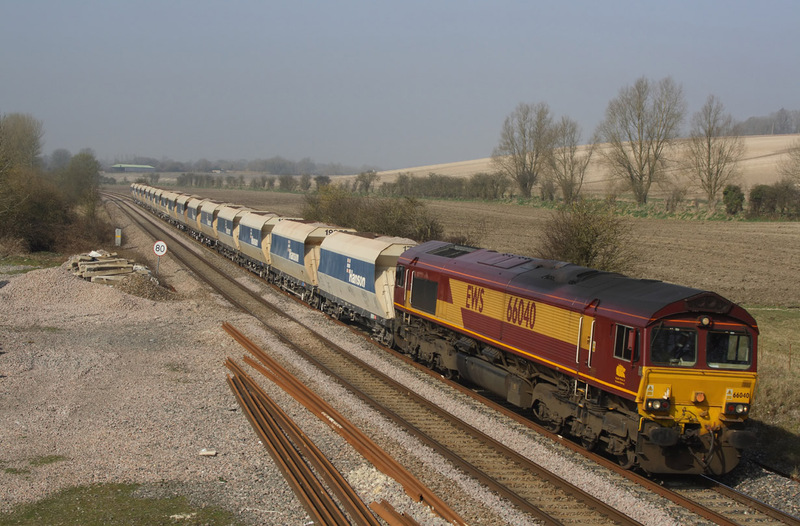 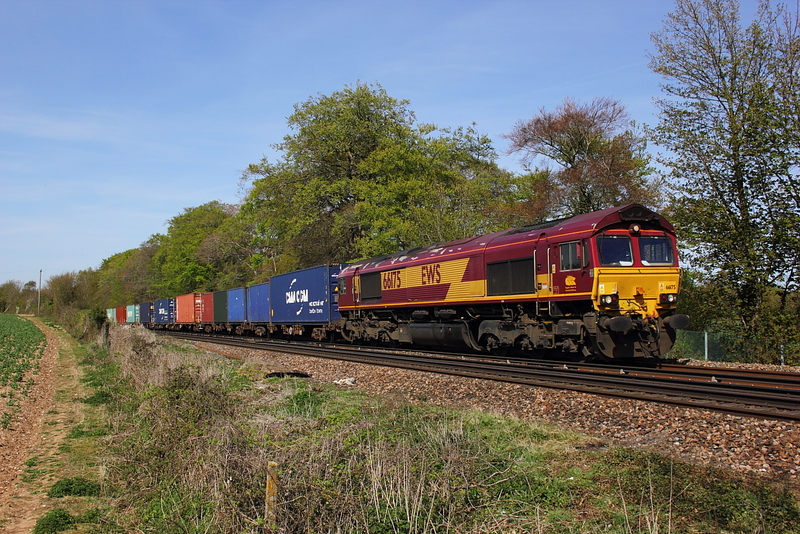 08/04/11 Manor Farm,Cholsey..66078..4M52 Southampton East docks to Warrington empty car transporter. 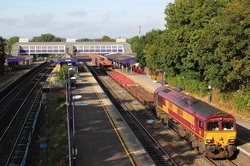 08/03/11 Chelmscote. 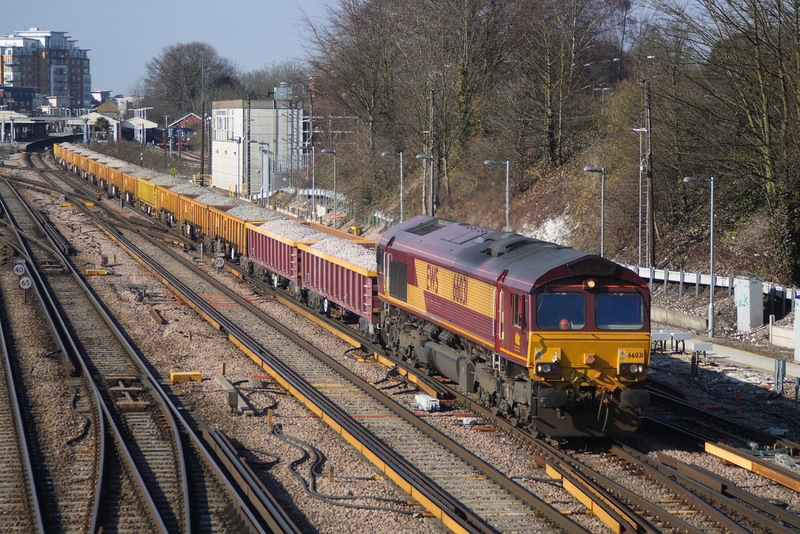 66016..6H50 Willesden to Tunstead cement empties. 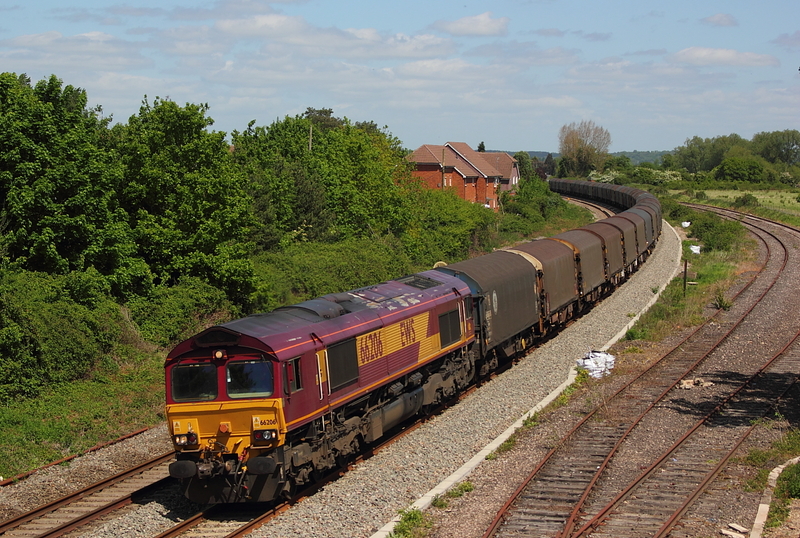 A very late running 6V99,Bescot(from a layover in Worcester yard)to St.Blazey allowing a daytime shot of the clay empties,seen here passing Gossington,with 66207. 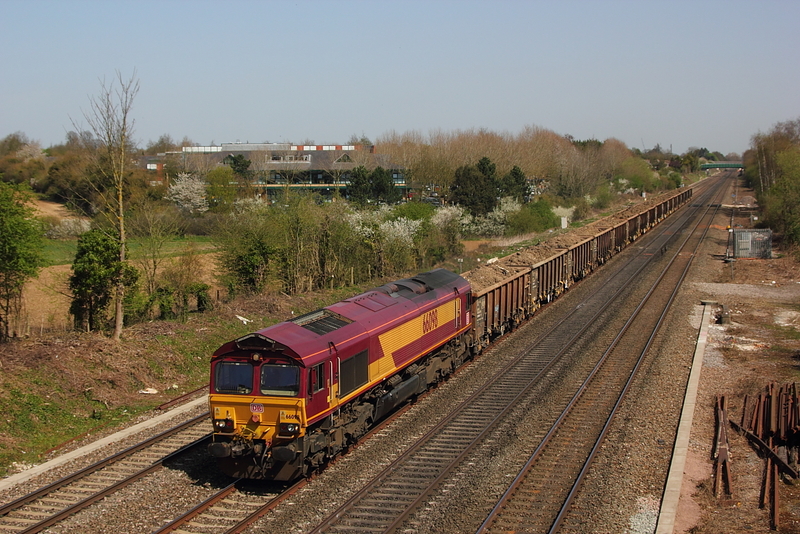 66009+66115+66006..6M60 Exeter to Bescot(from A.D.Jnct.) 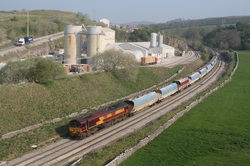 china clay. 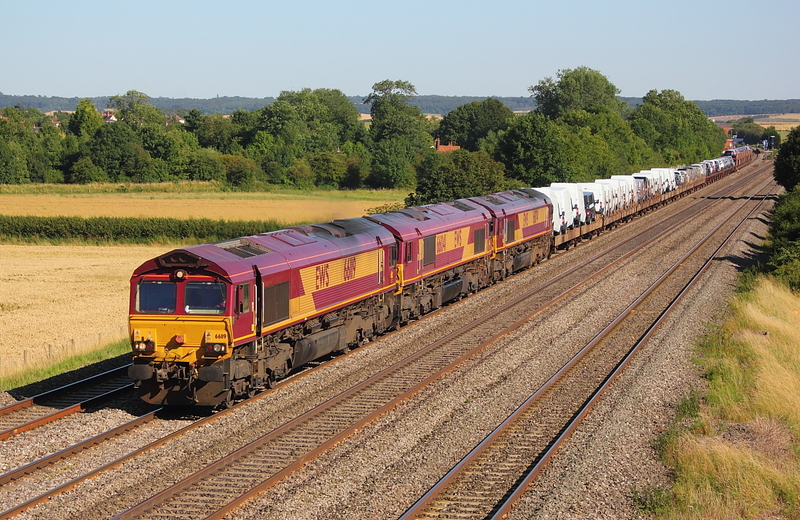 66124..6M20 Whatley to St. Pancras loaded ex. RMC hoppers. 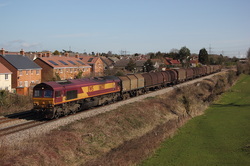 With the trial of Class a 59/2 on the Robeston to Westerleigh Murco tanks taking place to eliminate reliance on Class 60's,the Robeston to Theale tanks would seem to be in the hands of a single Class 66,abeit with a shorter load,however for a while it seemed a good bet for a pair on the Saturday workings,as here with 66006+66180 passing Badminton with 6B33,the return empties to Robeston.As time would tell this all proved that a tug was far better on these workings as even today they still mainly dominate the workings. 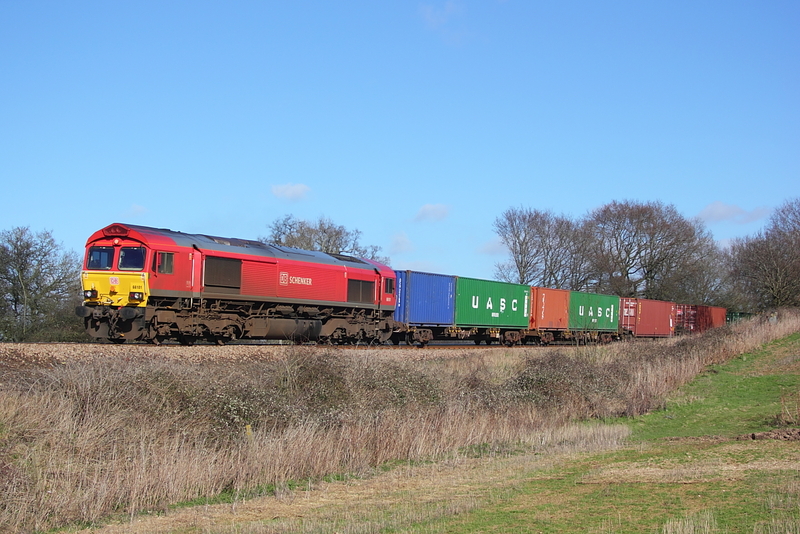 Waiting at Basingstoke for a GB 66 on 6G15,Eastleigh to Queenstown ballast and what turns up is a hired in DBS 66031 instead,but what the hell ,the sun was out. 66091 passes White Waltham on a diverted (via WCML) 4O53 Wakefield to Southampton inter-model. 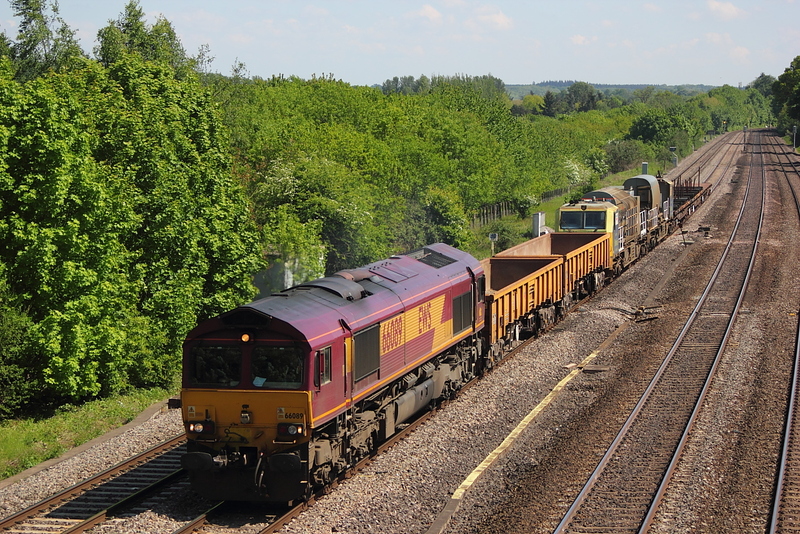 With the tugs temporarily out of favour on the Murco tanks,66140+66126 pass Shrivenham on a Saturday 6B33,Theale to Robeston empties. 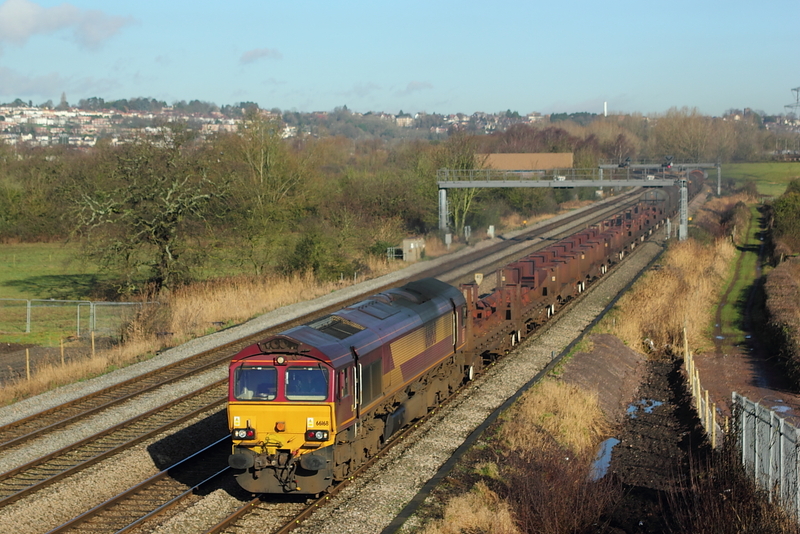 With the south having a unusual amount of snow ,and the usual mayem it seems to cause,the camera was out to record the railway scene,before the big melt .Within walking distance,66161 passes Battledown on 6O26 Hinksey to Eastleigh engineers. 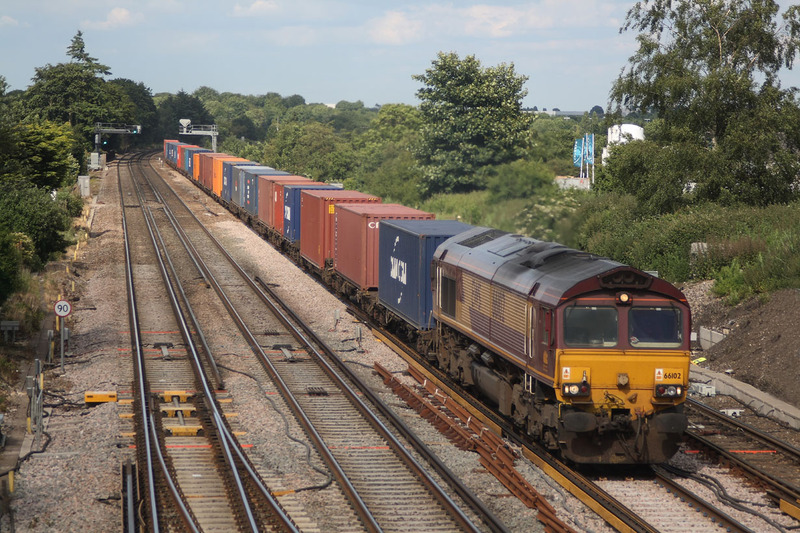 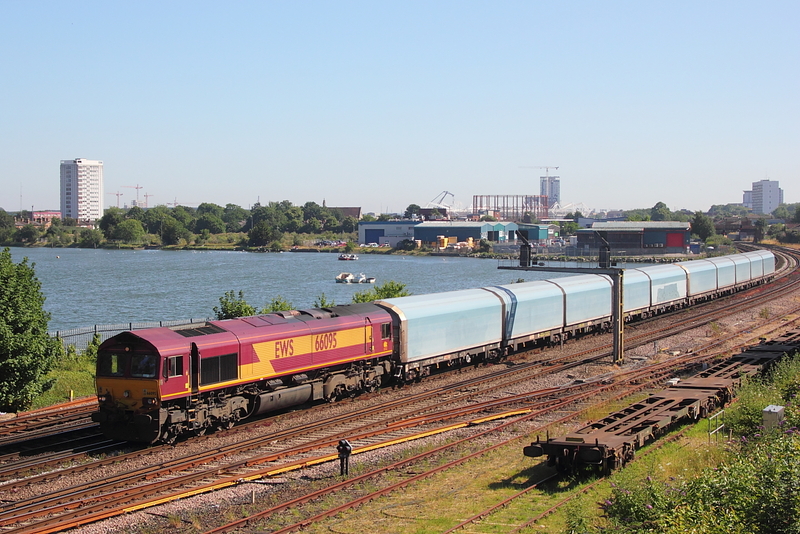 66130..6M58 Southampton East Docks to Bescot empty car carrier. 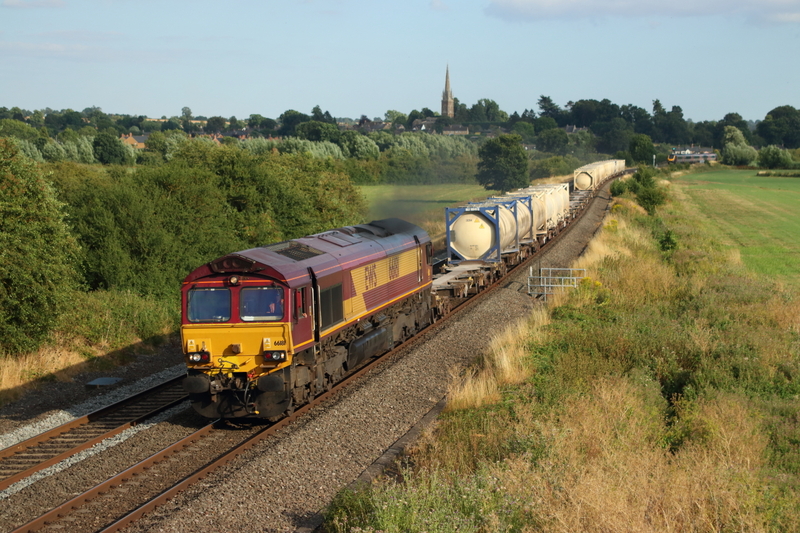 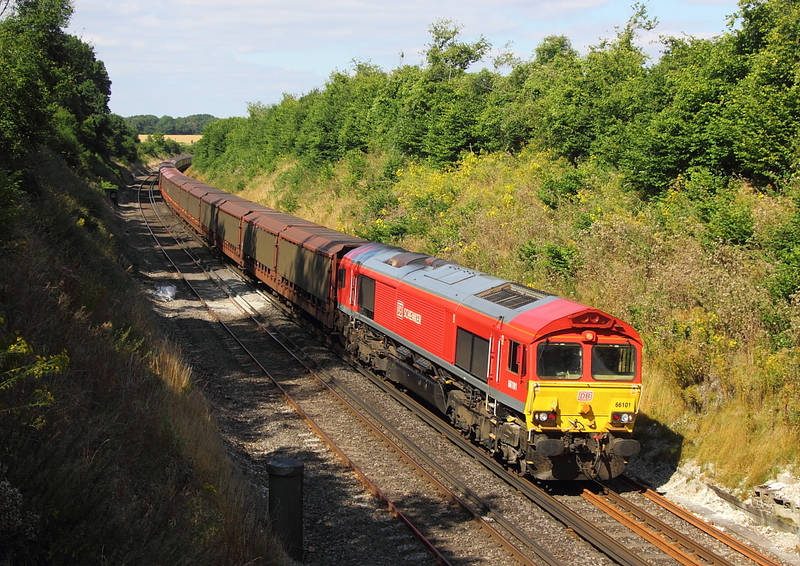 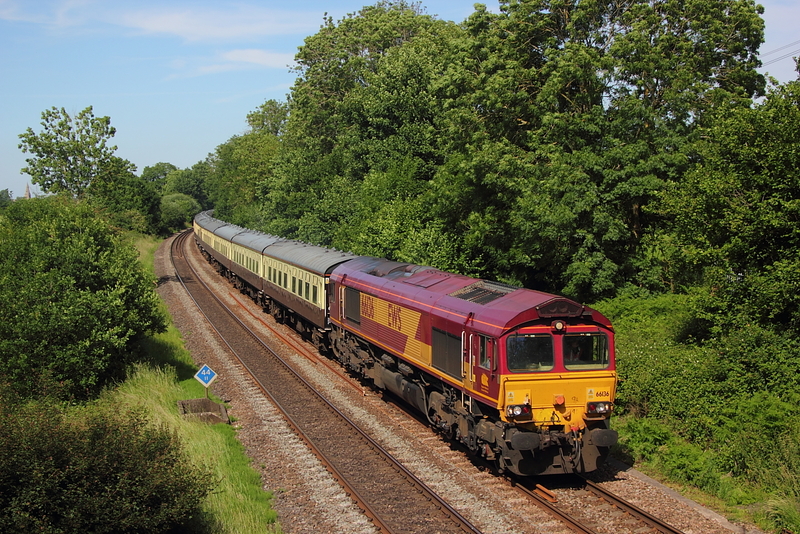 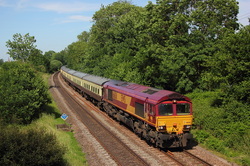 66068 Didcot to Ludgershall cable train. 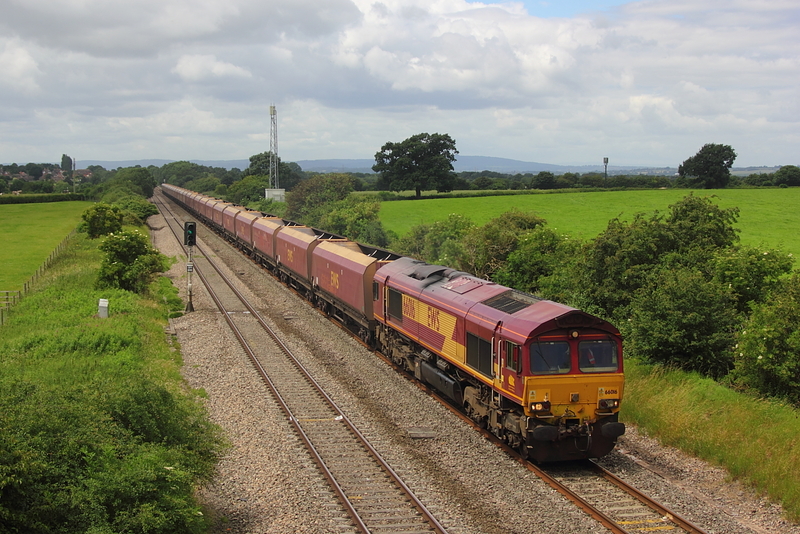 66085..6M60 Tavistock Jnct. 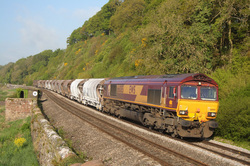 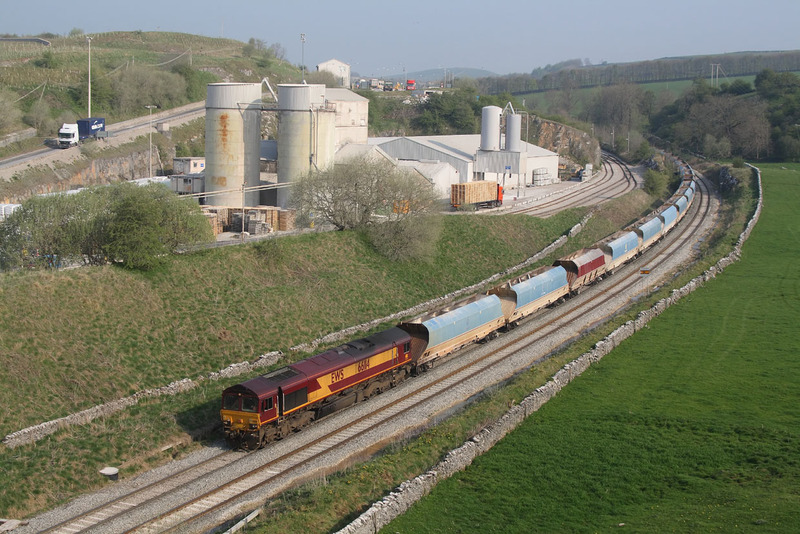 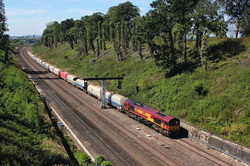 to Bescot loaded china clay. 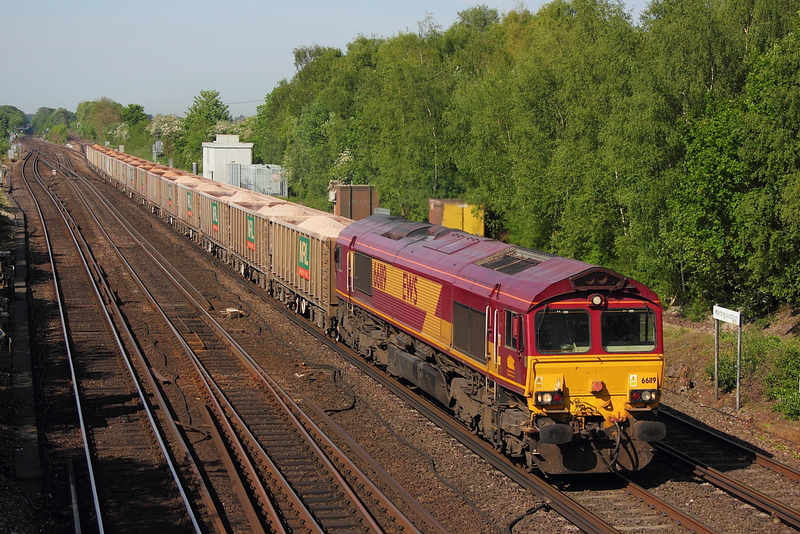 66156+59103"Village of Mells"6v18 Hither Green to Whatley empty Hanson hoppers. 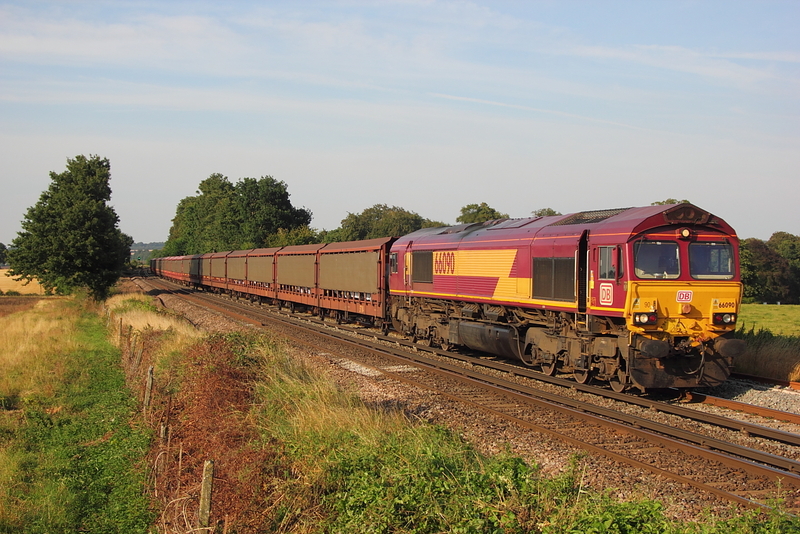 66111..6M20 Whatley to St.Pancras loaded ex RMC hoppers. 66137 Didcot P.S. 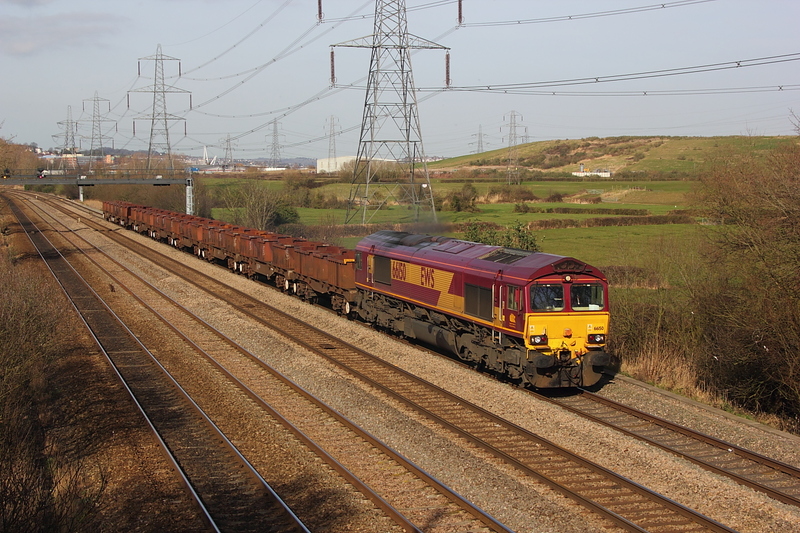 to Avonmouth coal empties. 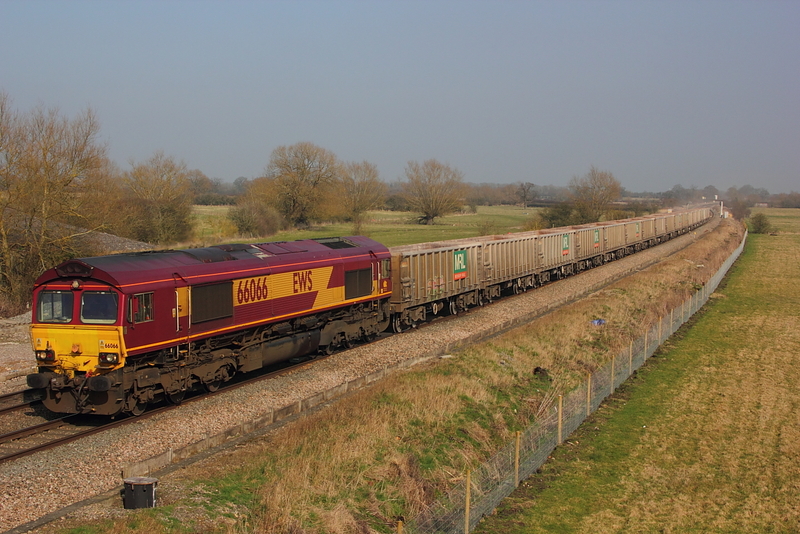 66102..6M20 Whatley to St.Pancras loaded ex RMC hoppers. 66040..7A74 Whatley to Theale loaded Hanson hoppers. 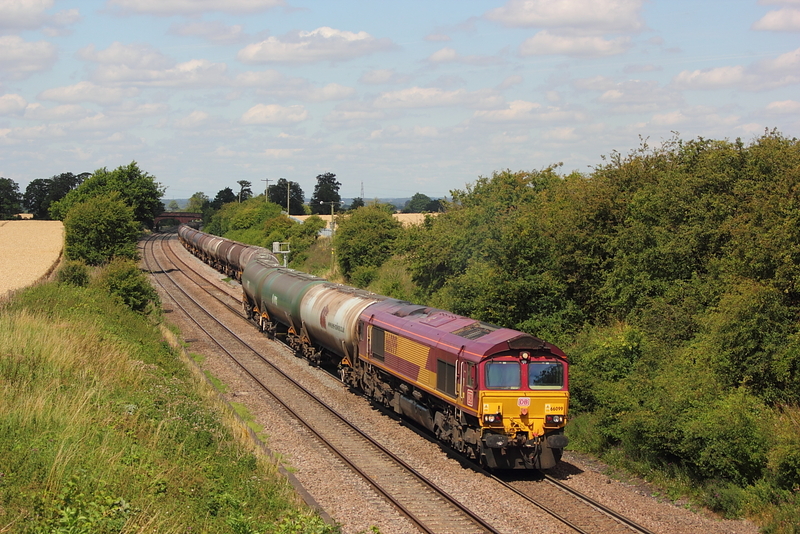 66012 on the Saturday 6B33 Theale to Robeston Murco empties,diverted via the B&H due to engineering work in the Swindon area. 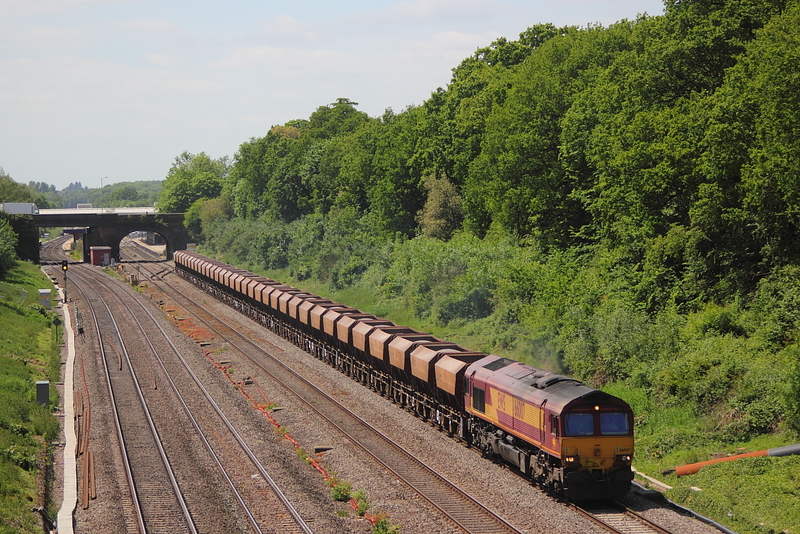 66107..6M20 Whatley to St. Pancras loaded stone. 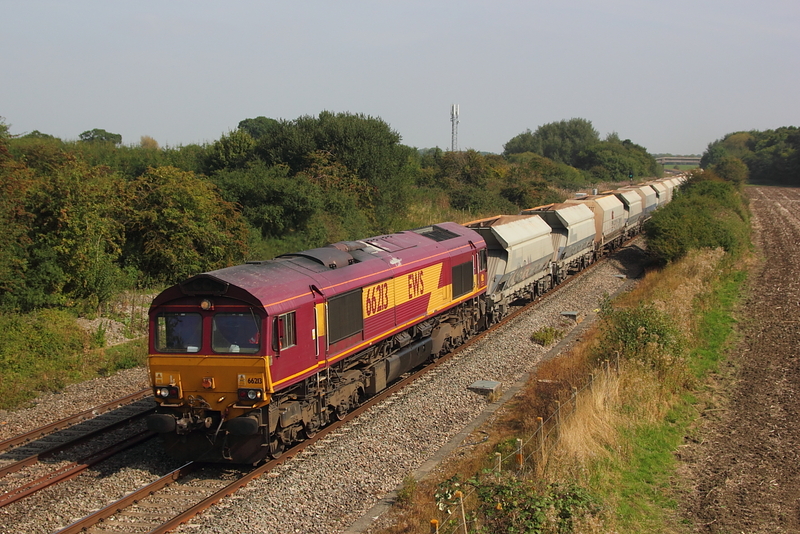 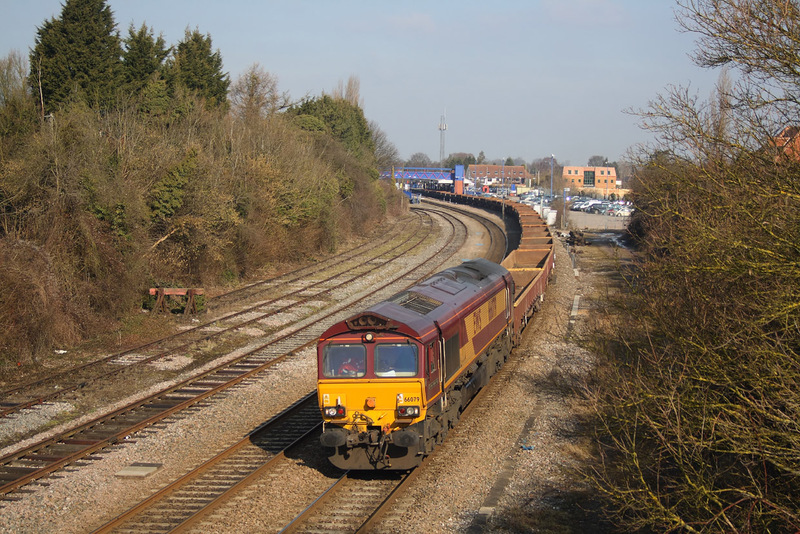 66046..6M28 Hinksey yard to Bescot. 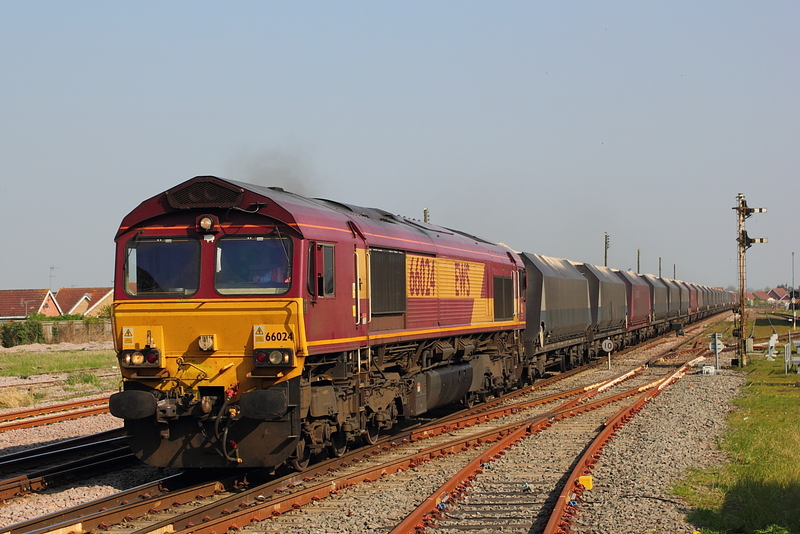 66025..6M58 Southampton West Docks to Bescot cars. 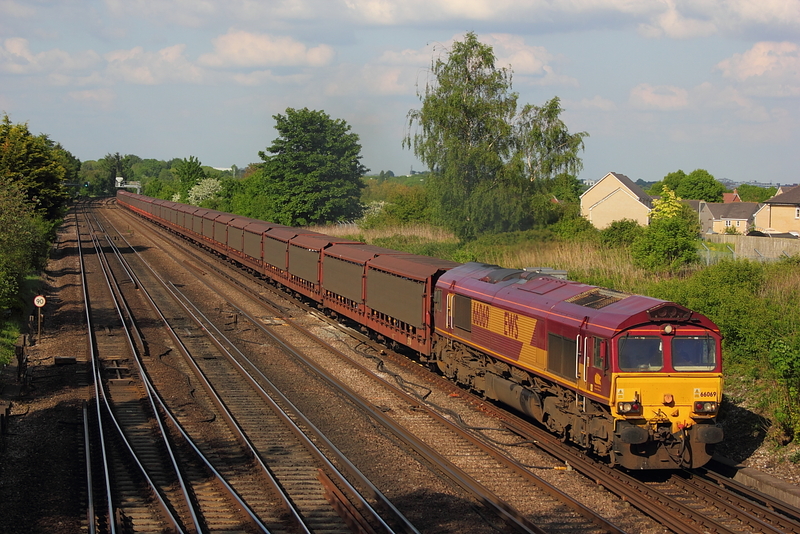 66102 on a late 4O27 Ditton to Southampton intermodel. 66114..6H37 Bredbury to Tunstead empties. 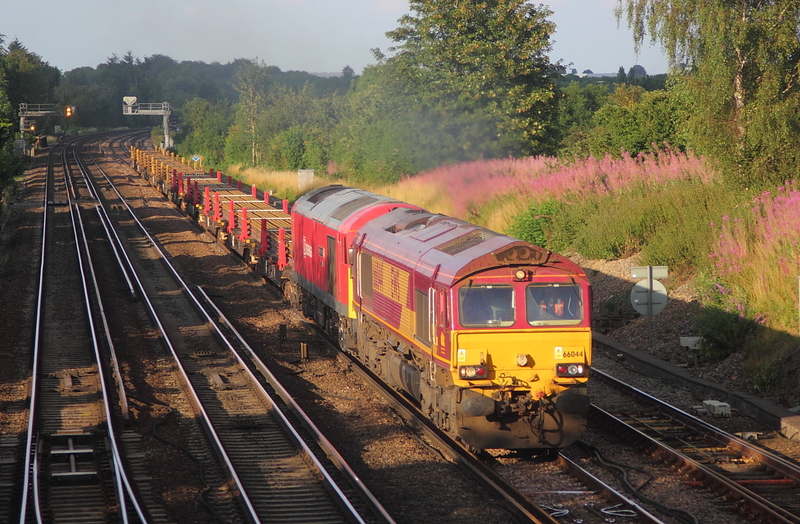 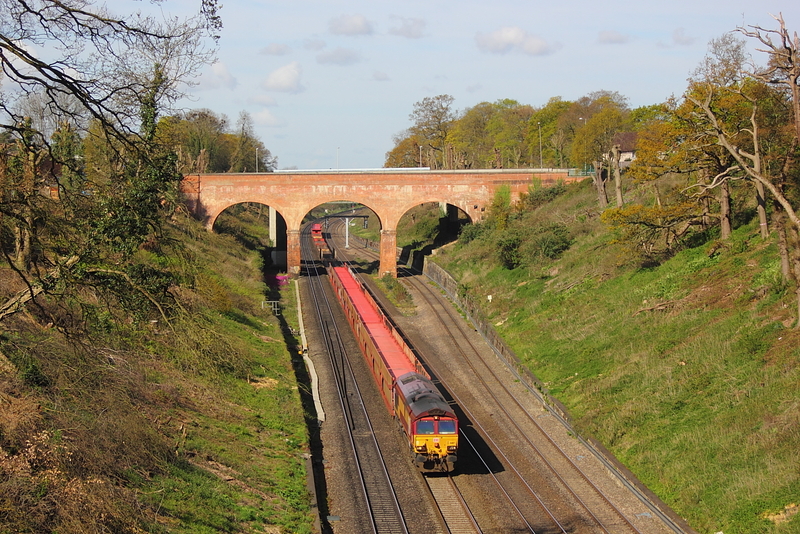 66186..6V27 Eastleigh to Hinksey yard. 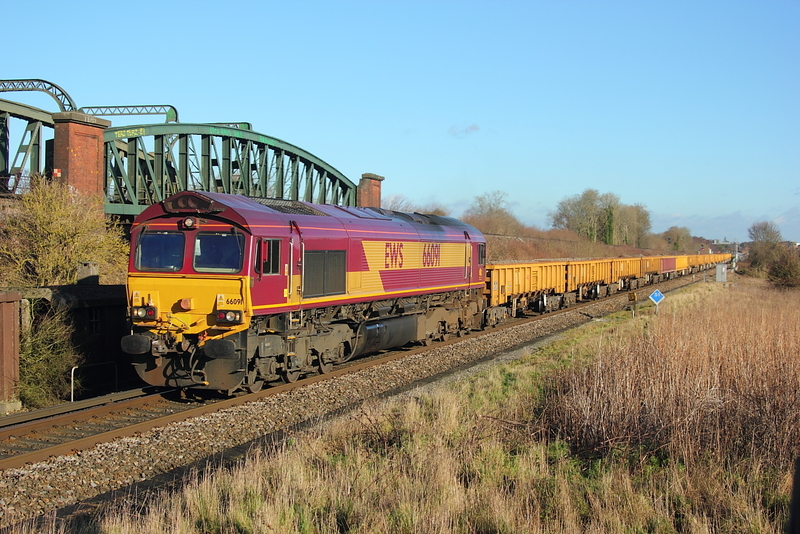 66197..6M20 Whatley to St.Pancras loaded ex.RMC hoppers. 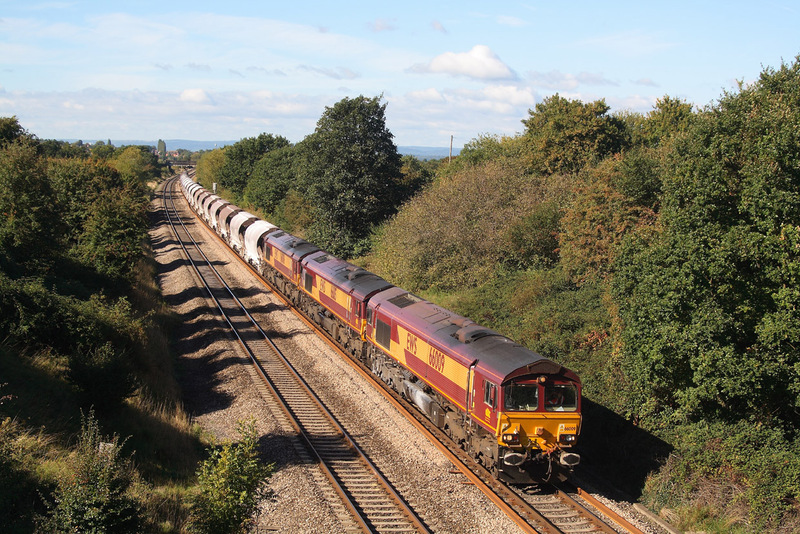 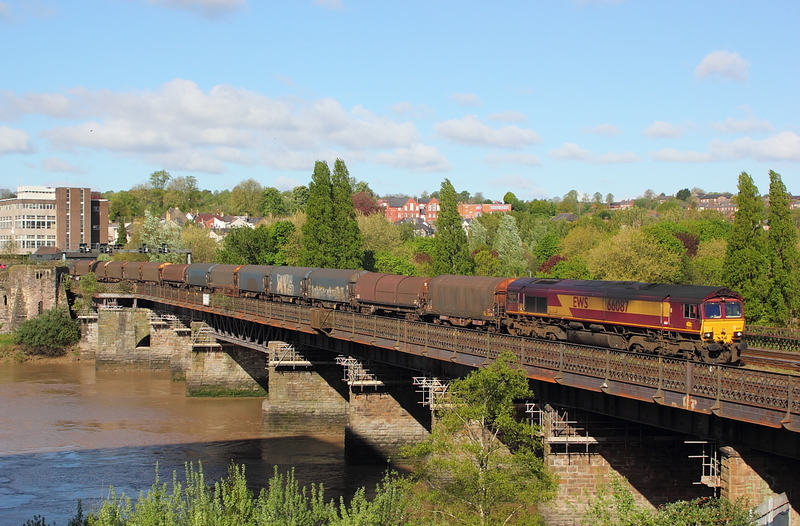 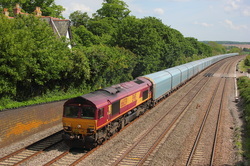 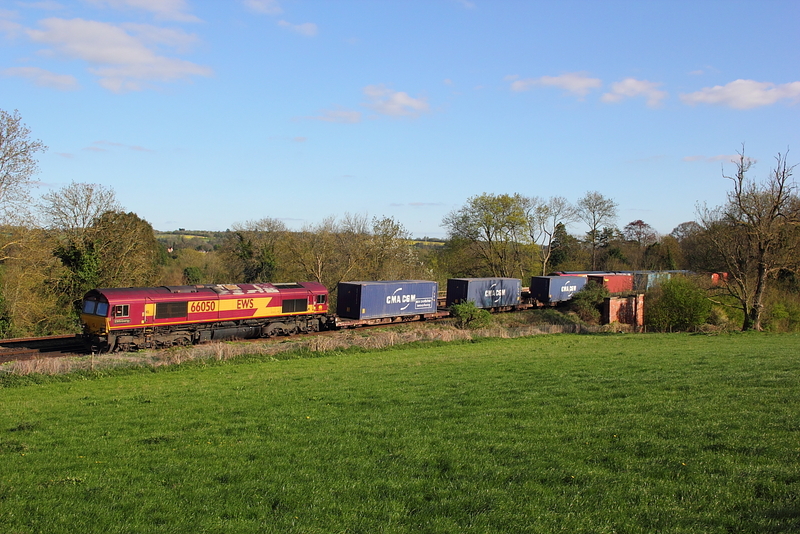 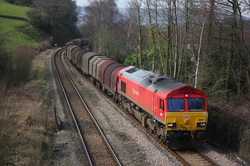 66181..6C23 Hayes to East Usk empties.